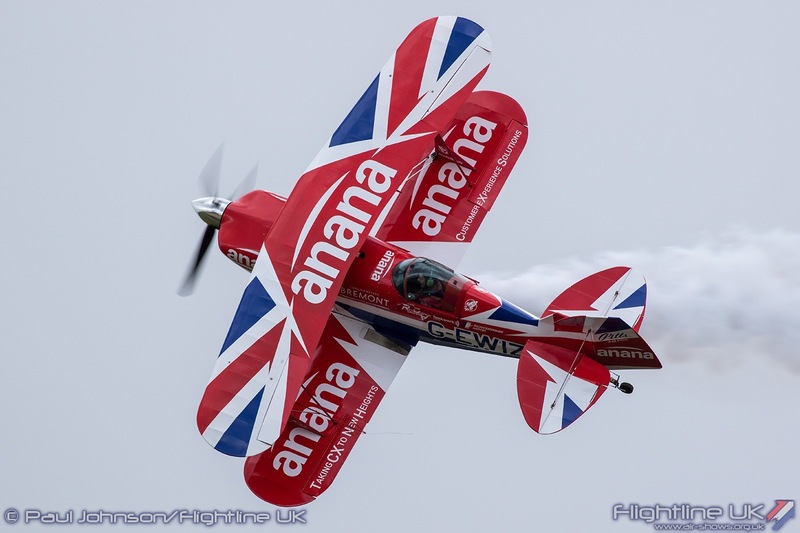 2017 was year of change for The Abingdon Air and Country Show. 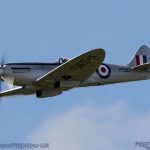 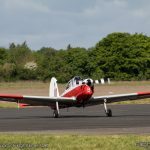 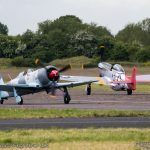 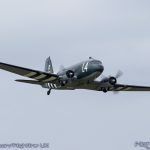 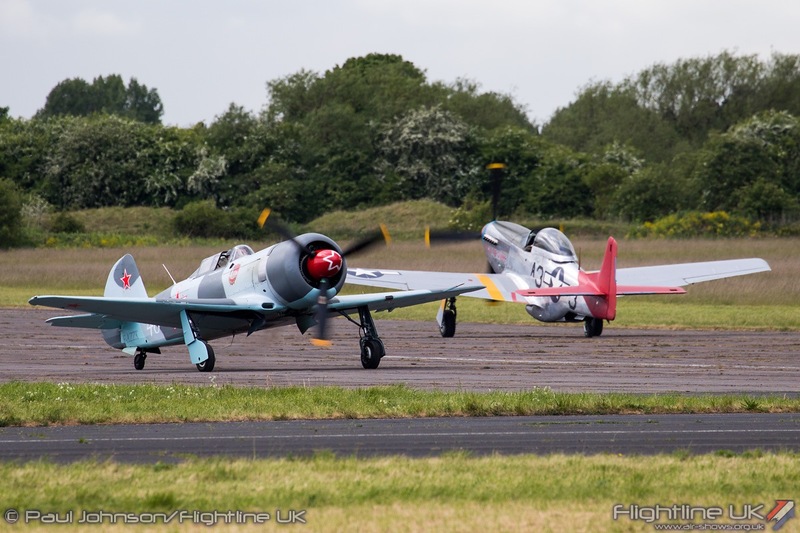 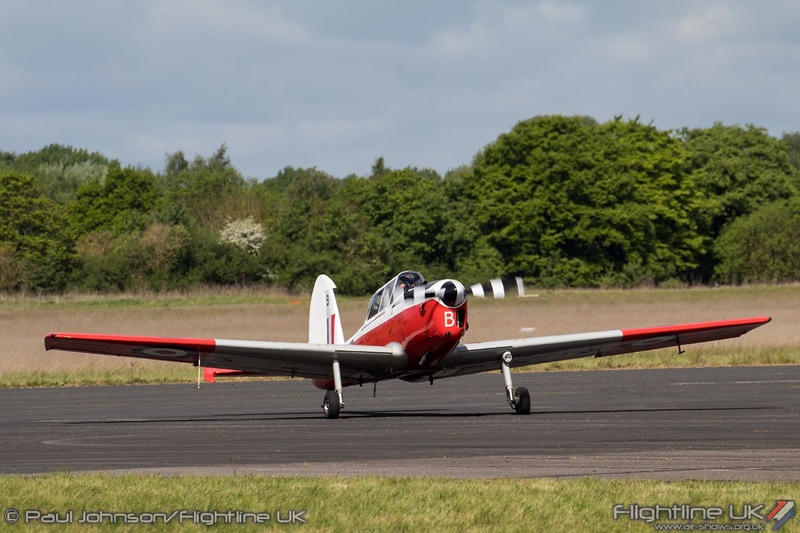 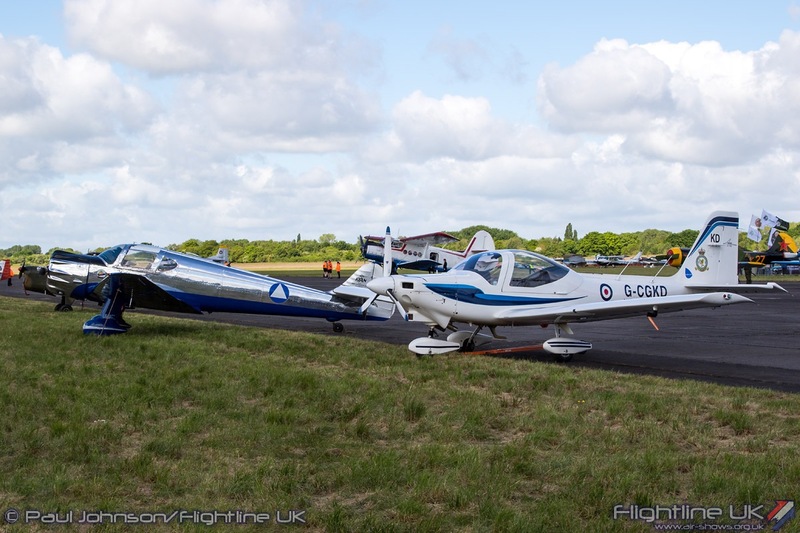 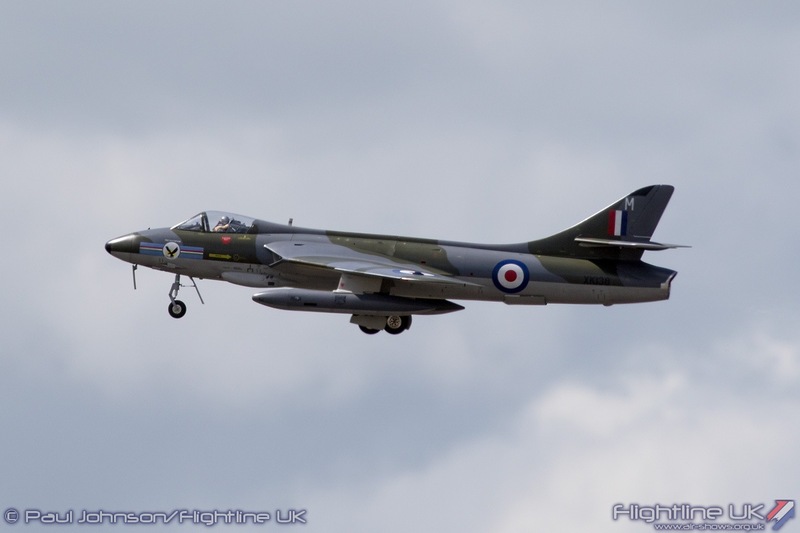 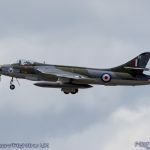 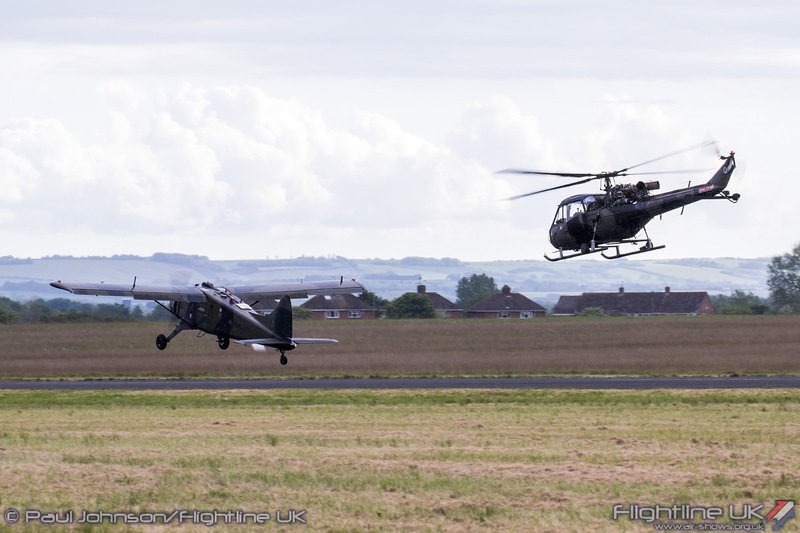 The event from its traditional May Bank Holiday slot to mid-May and also changed its showground layout significantly by moving across the main runway to the Dalton Barracks side of the airfield. 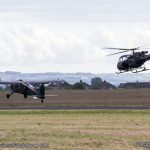 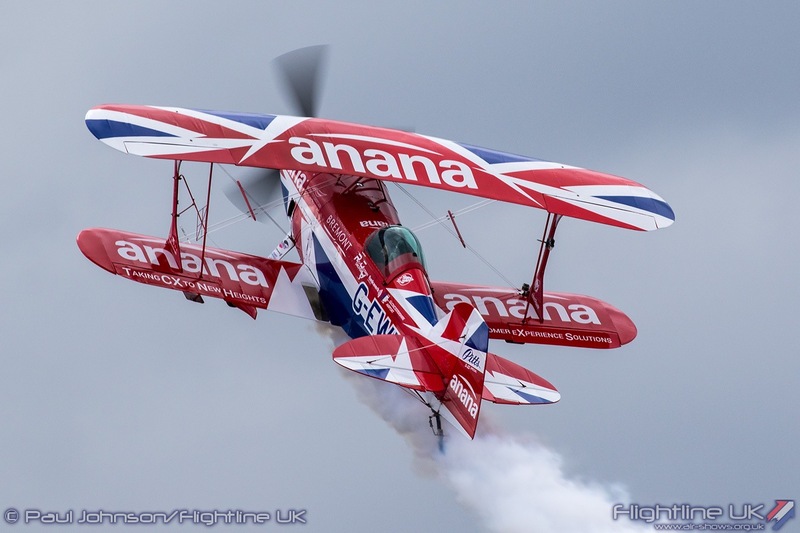 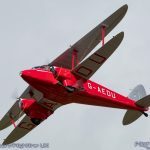 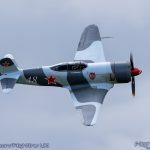 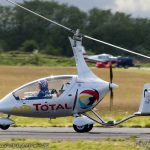 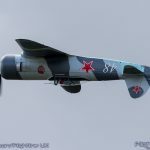 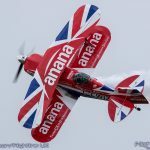 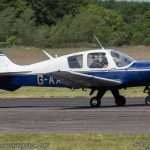 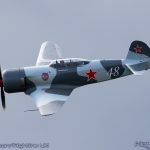 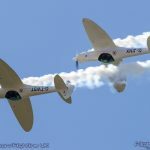 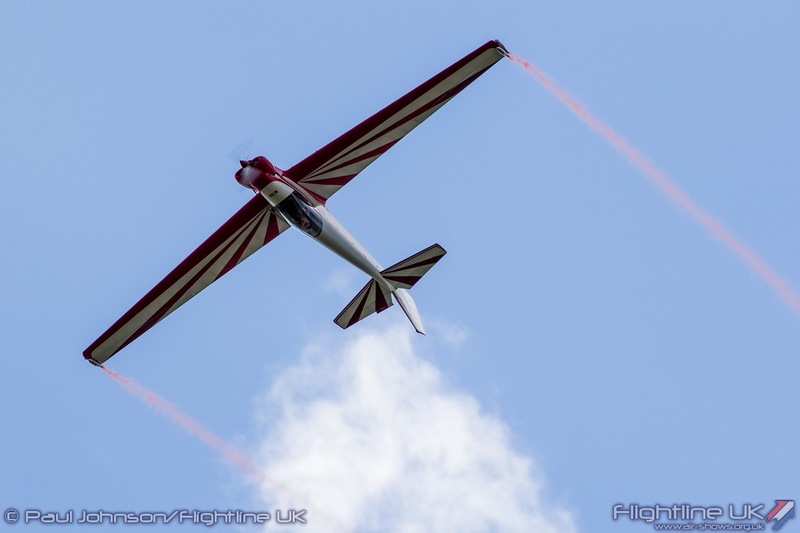 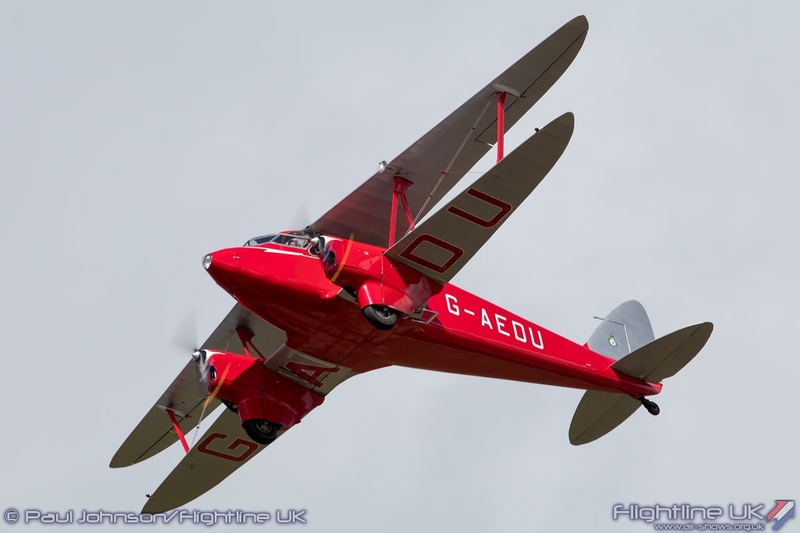 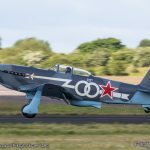 However what didn’t change was the great atmosphere and friendly feel to the event which is much more than just a flying display incorporating many elements from a local country show. 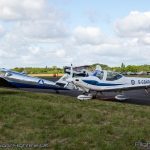 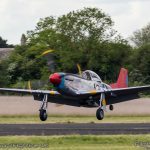 However, the show was overshadowed by an incident in the flying display involving one of the aircraft of the Twister Aerobatics Team which made a hard forced landing during a display. 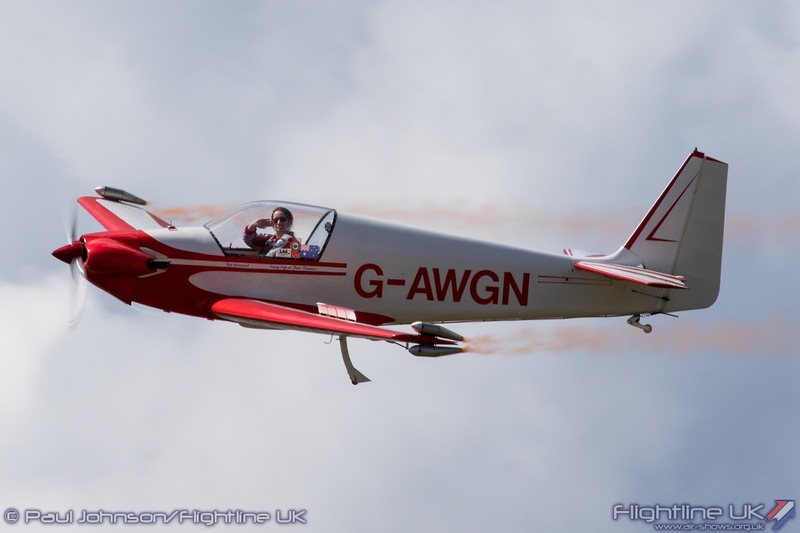 Happily though, we can report that the pilot, though injured is OK and is expected to make a full recovery. 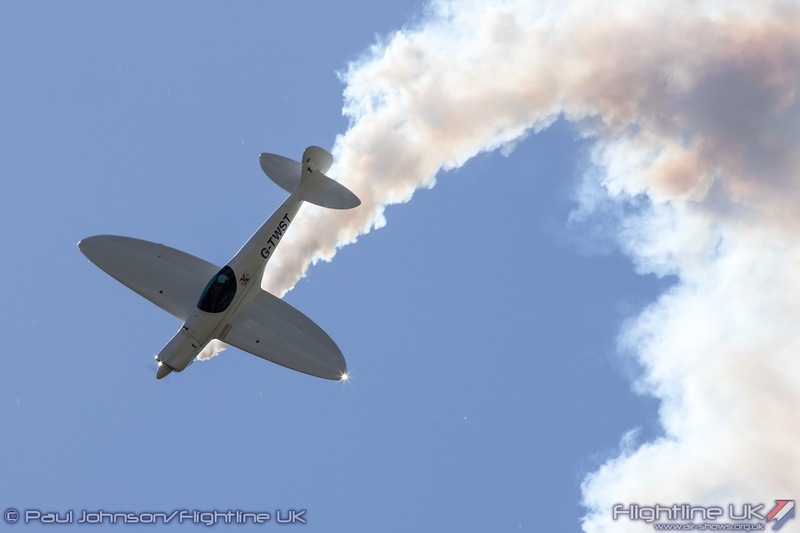 Flightline UK wishes the pilot all the very best for a full and speedy recovery. 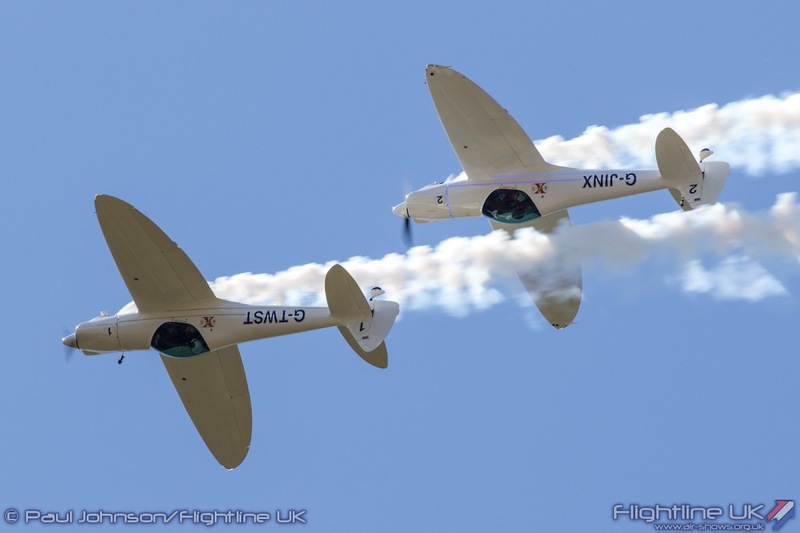 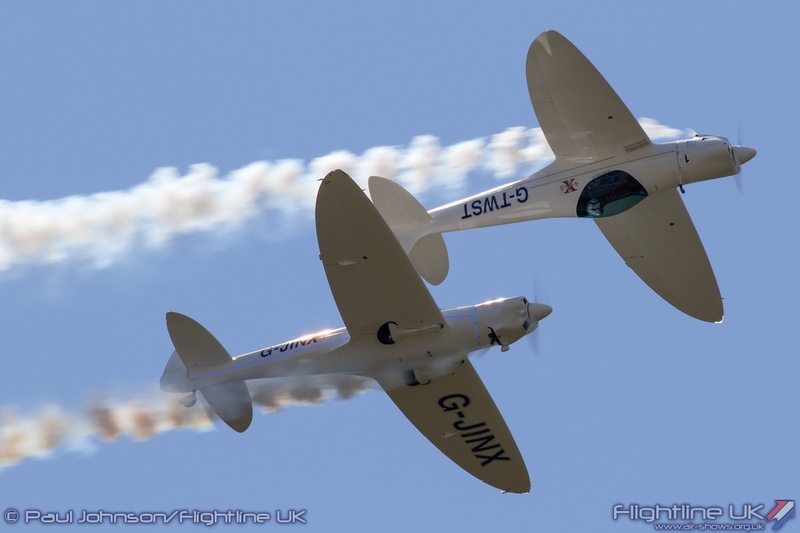 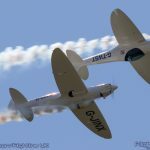 The Abingdon Air and Country Show is one of many small volunteer-run events across the display calendar. 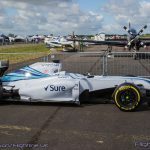 Even so, just like bigger events, it has had to cope with the many changes being adopted by the display industry to reduce risk to third parties. 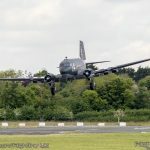 This was one of the main reasons that organisers decided to change the event layout to use the eastern side of the runway for the showground and move the display flying to the western side. 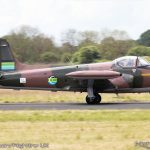 Despite the best efforts of the organisers, changes like this can often throw up new unexpected issues and for traders and public alike, there were delays getting in which was frustrating for all concerned. 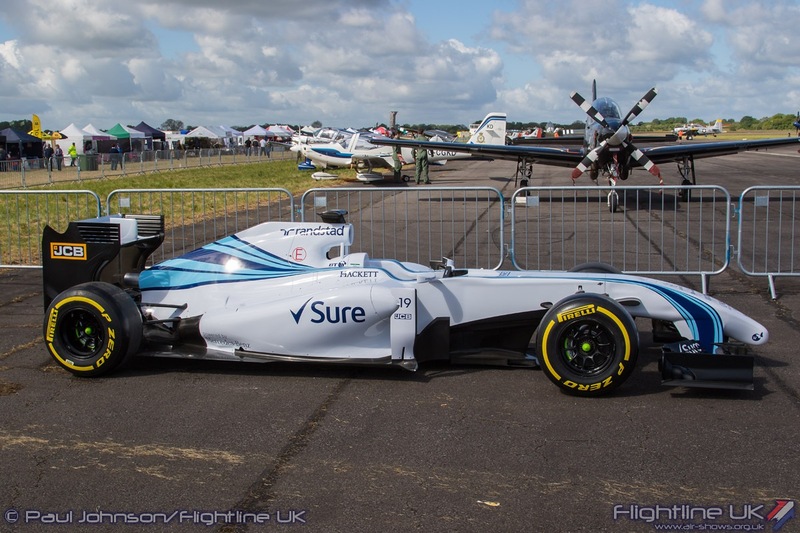 However, we are sure that the organisers will be able to overcome these issues for future events. 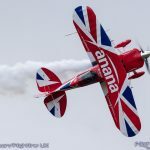 Despite the changes, the showground however had that same feel of local country show. 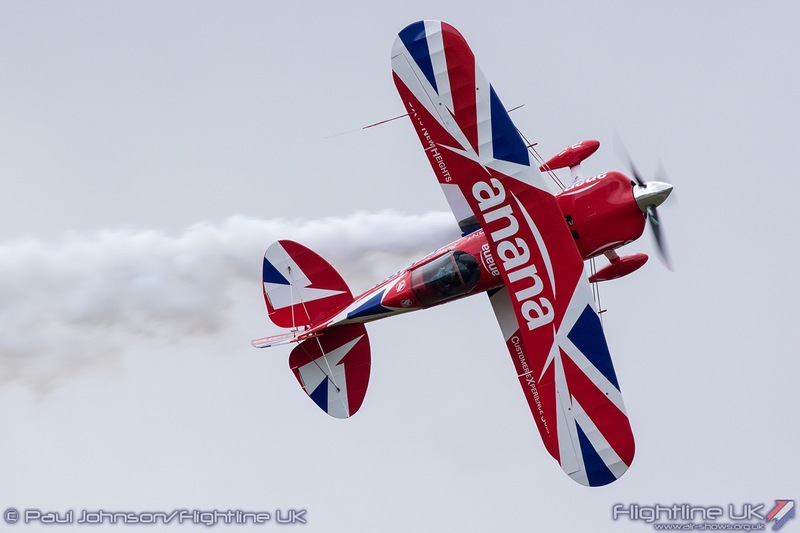 The centrepiece of the showground is an arena which home of a full day of displays and which is surrounded by steam engines and all kinds of trade stalls. 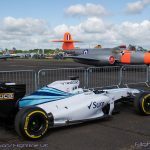 Amongst the attractions returning was a show-car from the locally based Formula 1 team, Williams. 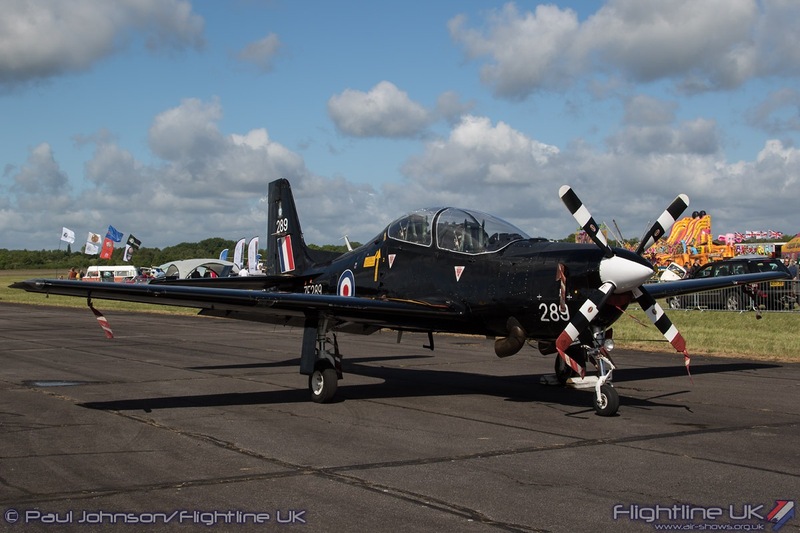 As well as about three and half hours of flying display, Abingdon also hosts a large fly-in of visiting aircraft, some of which are positioned for static display. 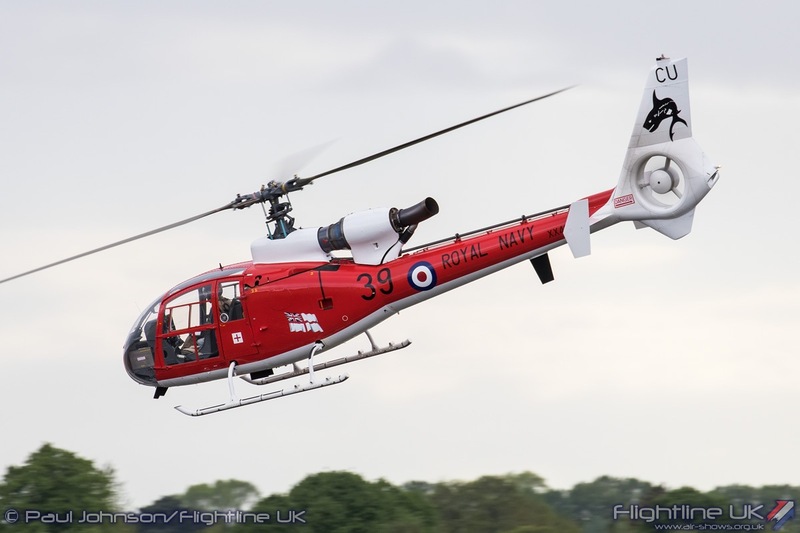 While the RAF has left Abingdon, it does have active RAF airfield close by in the form of RAF Benson and RAF Brize Norton. 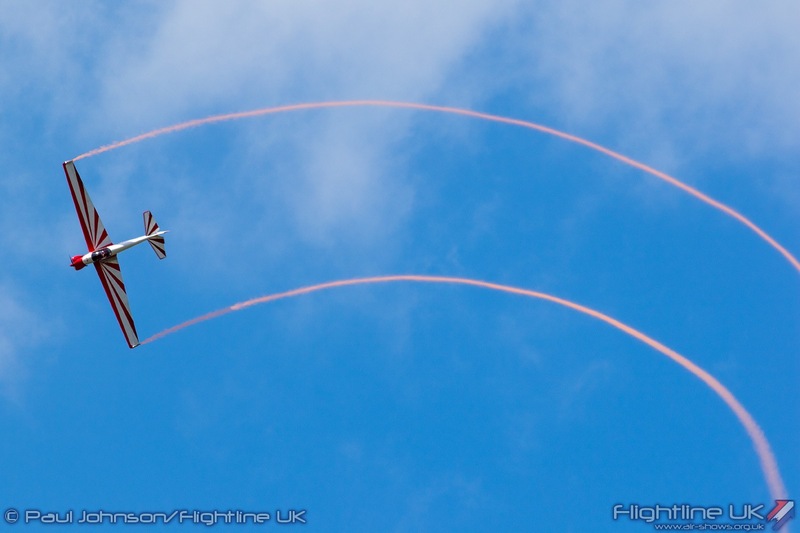 During the day at Abingdon, it is not unusual to see an A400M, Hercules, Voyager or C-17 appear on the northern horizon as they join the Brize circuit. 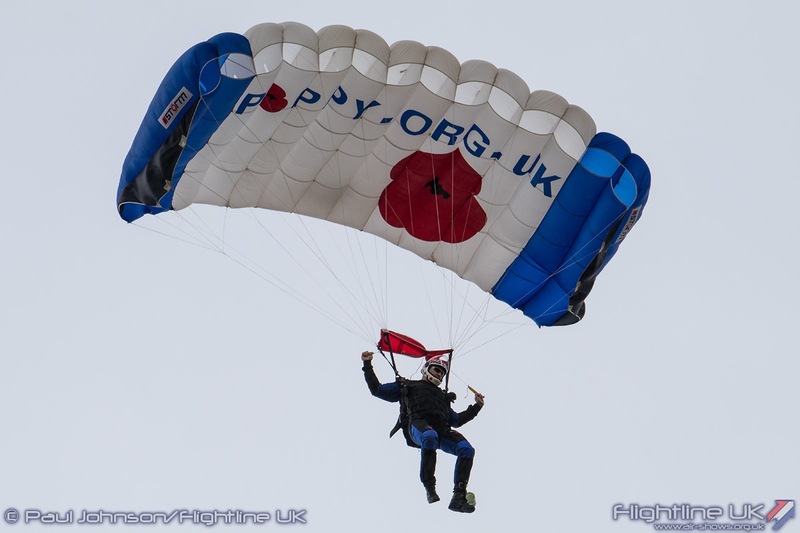 They are however very busy bases and were unable to support the event this year. 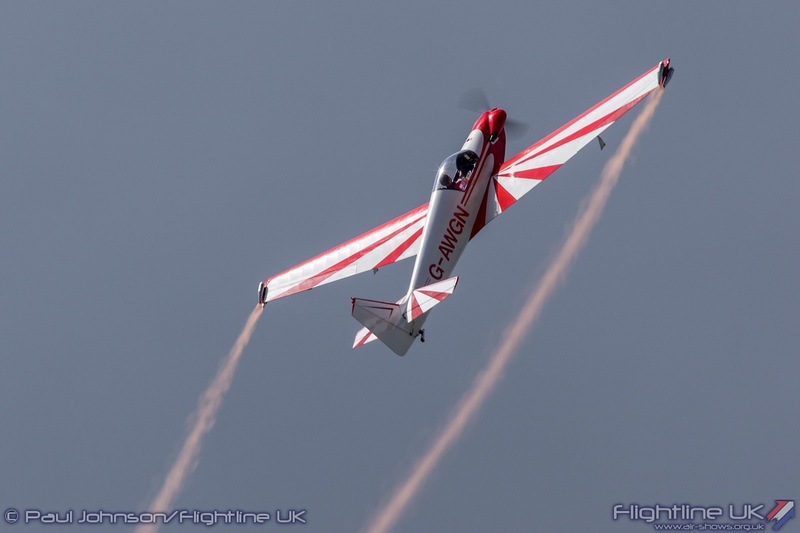 Even so it is understandable that this was a frustration for the Abingdon organisers! 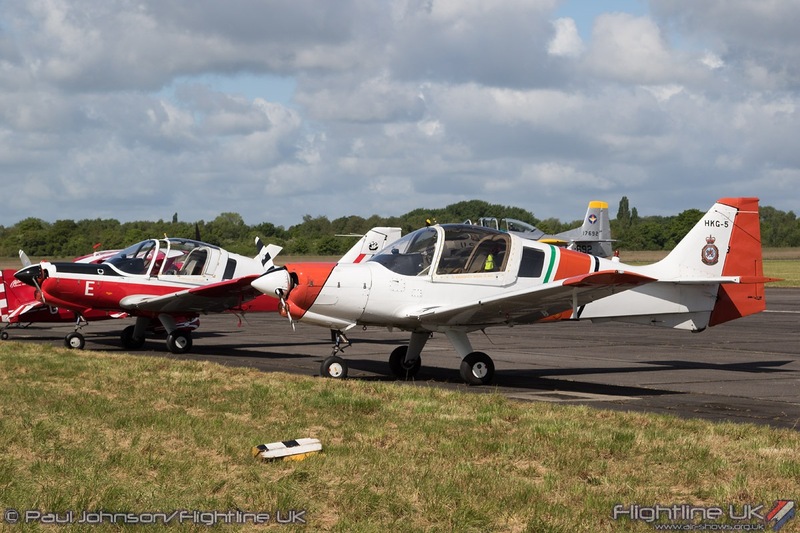 However, the static was not totally devoid of Royal Air Force participation; Oxford University Air Squadron did send one of their Grob Tutor T1s while No 72(R) Squadron from RAF Linton-on-Ouse were represented in their centenary year by a pair Shorts Tucano T1s. 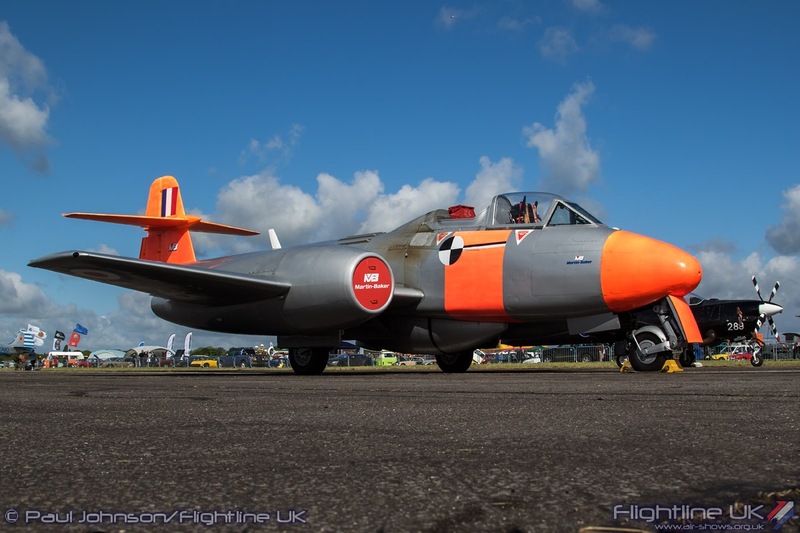 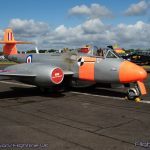 A very welcome last minute surprise in the static area was the Gloster Meteor T7½ from Martin Baker based at nearby Chalgrove. 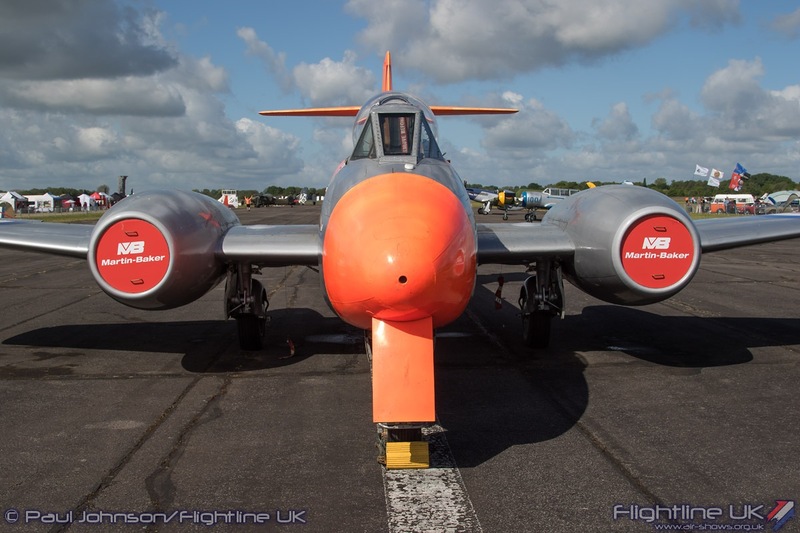 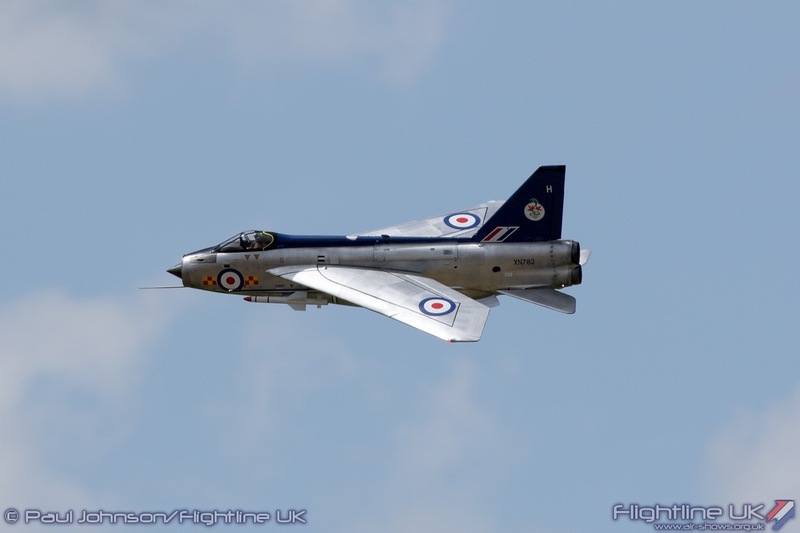 With the sale of the Air Atlantique Meteors to the US, the Martin Baker Meteors, which are still used a flying test-beds for the company’s ejection systems, are the last remaining examples of Britain first operational jet fighter left airworthy. 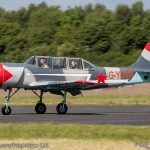 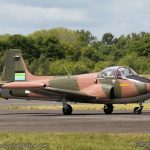 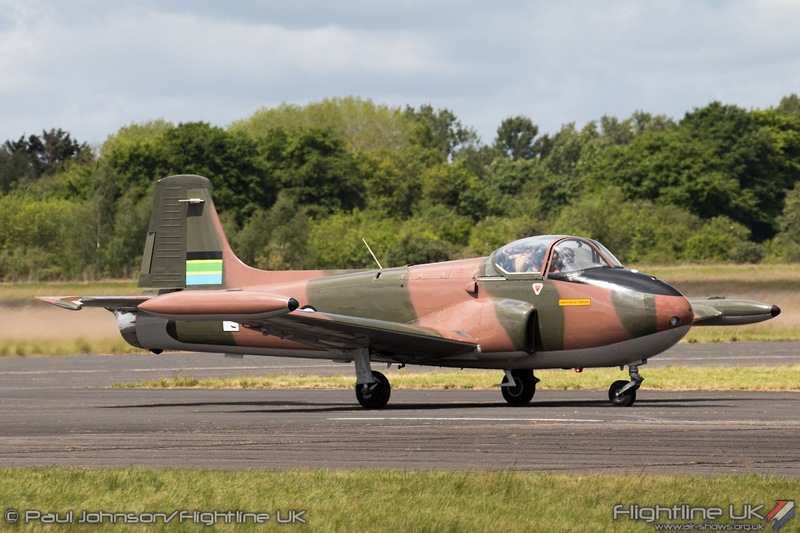 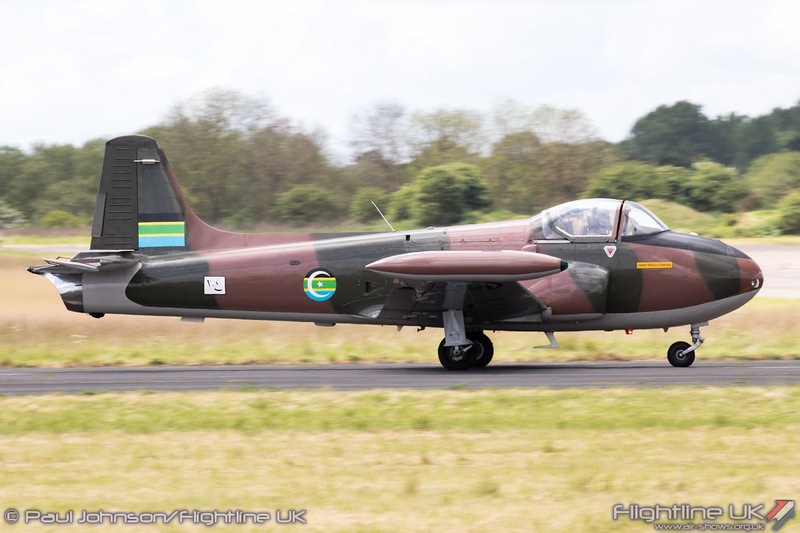 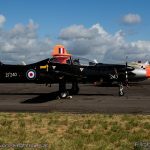 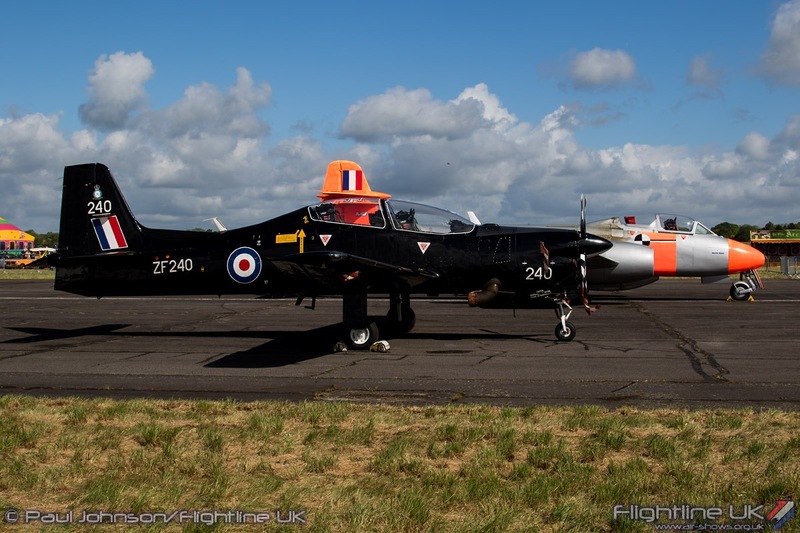 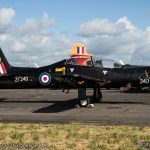 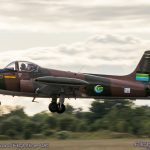 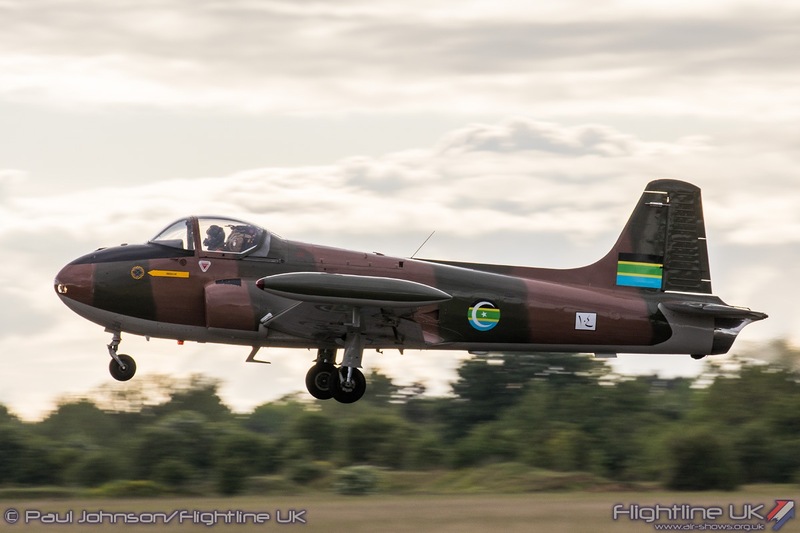 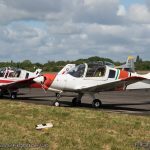 Another surprise classic jet on static display was the North Weald based BAC Jet Provost T52 wearing the markings of the South Arab Air Force. 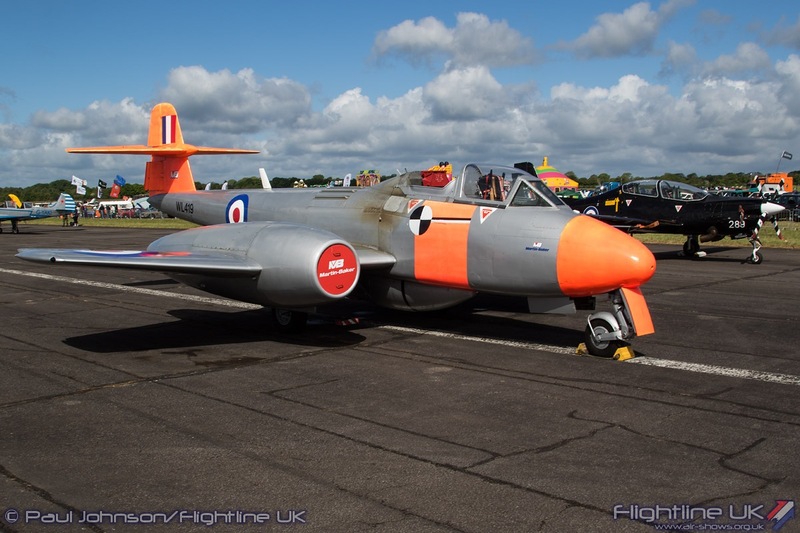 Other rare participants on static display included a pair of UK based warbirds. 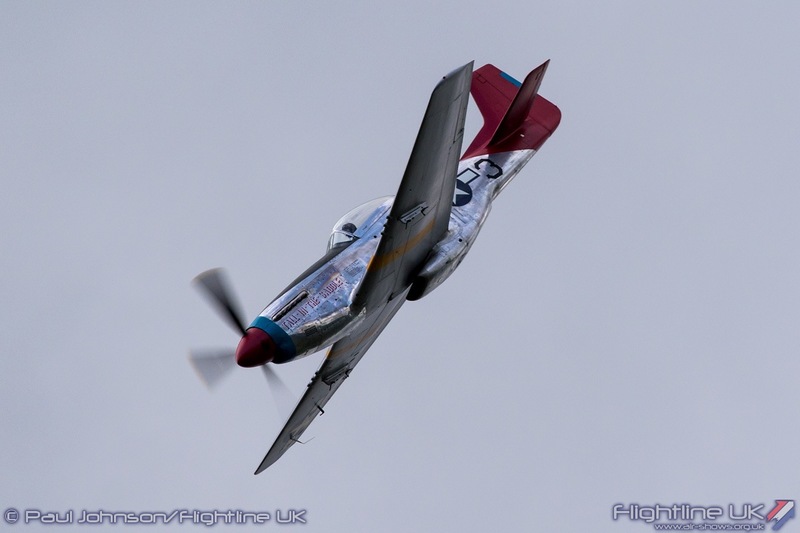 Robert Tyrell’s North American P-51D Mustang ‘Miss Helen’ was joined by Will Greenwood’s Yakovlev Yak-3UM. 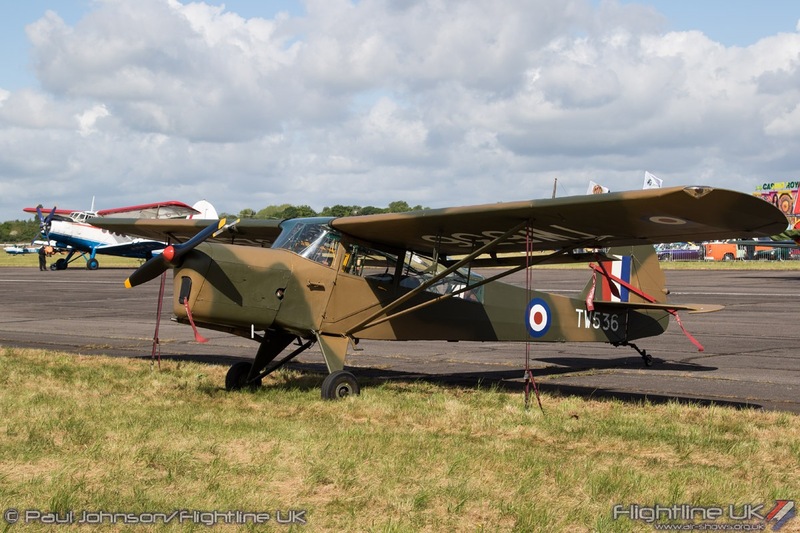 Other military historic types included example of the Taylorcraft Auster, de Havilland Canada Chipmunks, Scottish Aviation Bulldogs and the Gazelle Squadron’s Westland Gazelle HT2 wearing its distinctive Royal Navy markings. 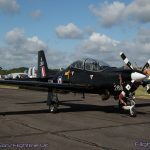 All always there a bumper collection of various civilian types keeping the runway busy throughout the morning alongside the aircraft arriving for the display. 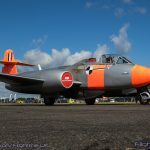 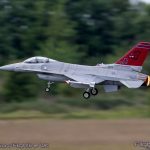 Another new attraction for 2017 ahead of the main flying display was some large scale model jet flying. 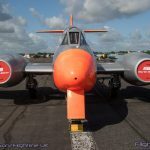 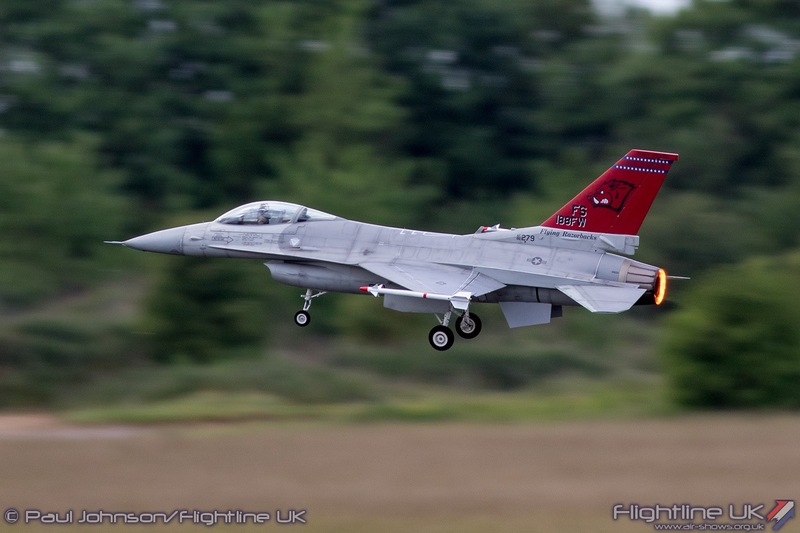 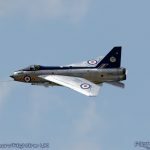 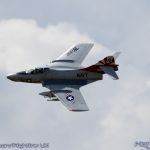 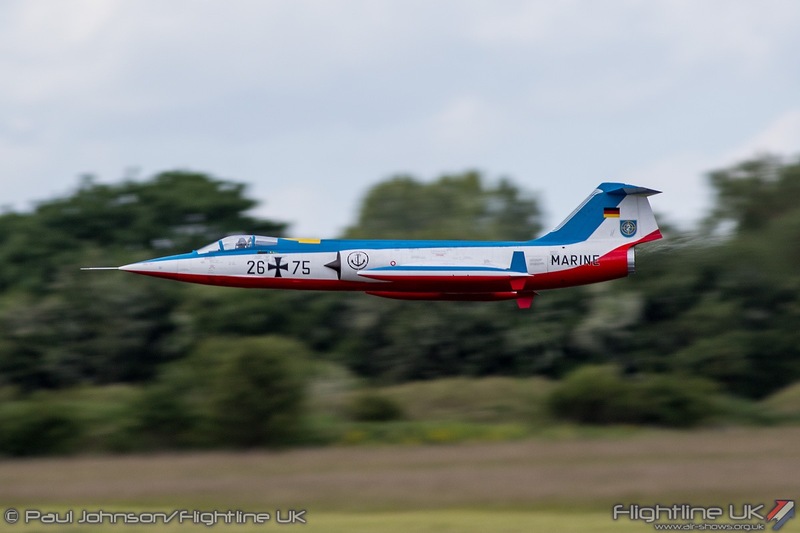 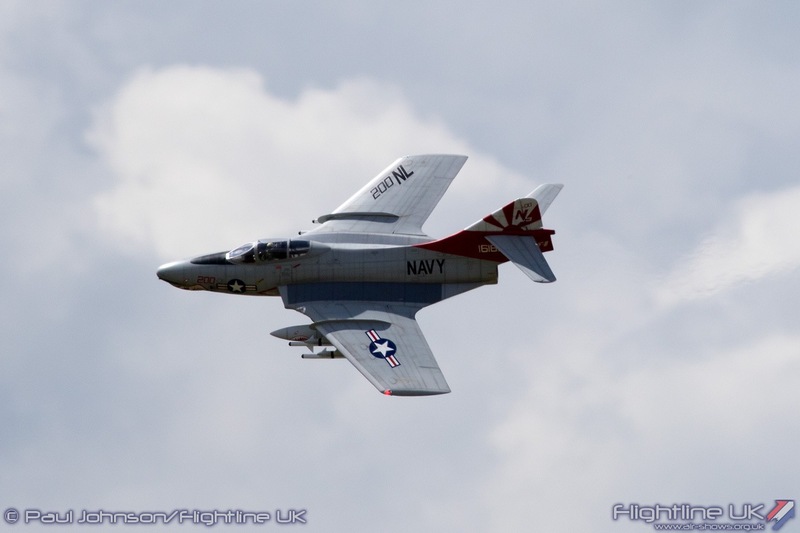 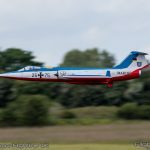 The models which included an English Electric Lightning, Lockheed F-104G Starfighter, Hawker Hunter, de Havilland Vampire, Douglas F9F Cougar and F-16 Fighting Falcon were simply incredible and looked every bit like the real machines in the air. 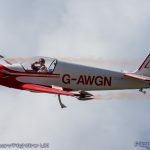 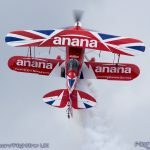 Despite some difficulties with aircraft and display acts not being ready for the early display season, Neil Porter’s planned flying display looked very full and entertaining on paper. 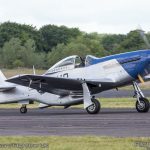 Sadly, due to the Twister’s forced landing and the necessary response we didn’t get to see the full display. 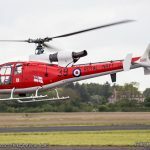 Praise must go to the emergency services for dealing with the incident so professionally and in a very swift and calm manner. 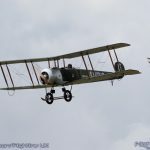 Credit too should be given to those around show control as well; particularly Ben Dunnell for keeping everyone informed with his measured, reassuring announcements and commentary plus the Flying Control Committee and Air Traffic Control team led by John Davies for their quick thinking in rejigging the flying display so it could carry on presenting nearly all of the advertised acts. 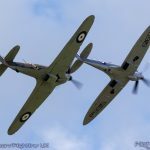 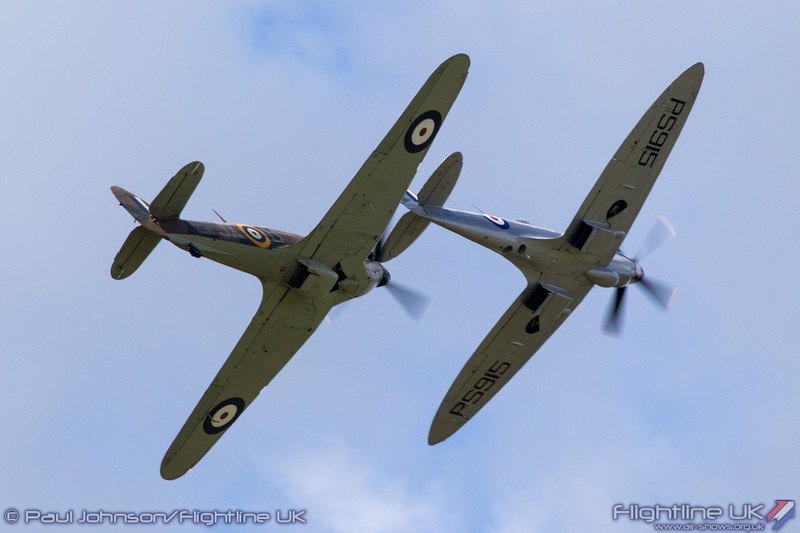 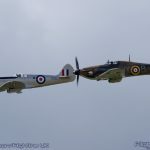 Opening the show was the sole Royal Air Force display team taking part, the Battle of Britain Memorial Flight with a duo of Supermarine Spitfire PRXIX and Hawker Hurricane IIc. 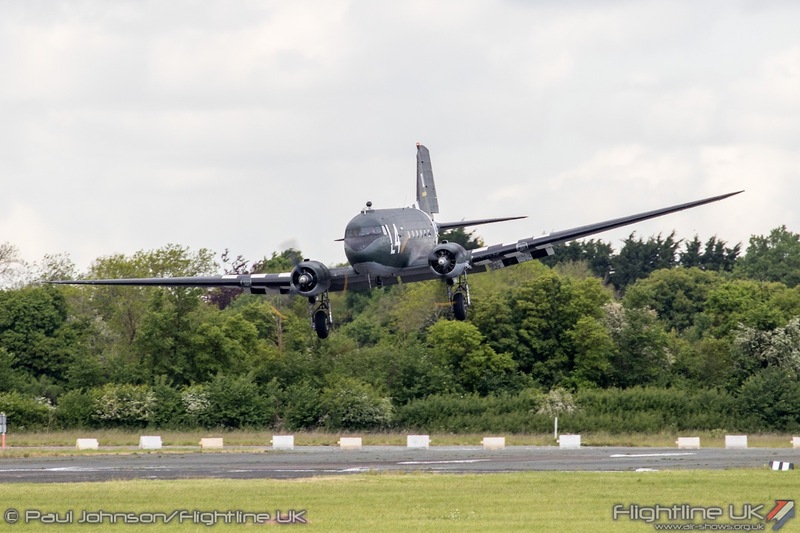 The flight had hoped to bring either the Lancaster or Dakota with the fighters, but both were still in maintenance. 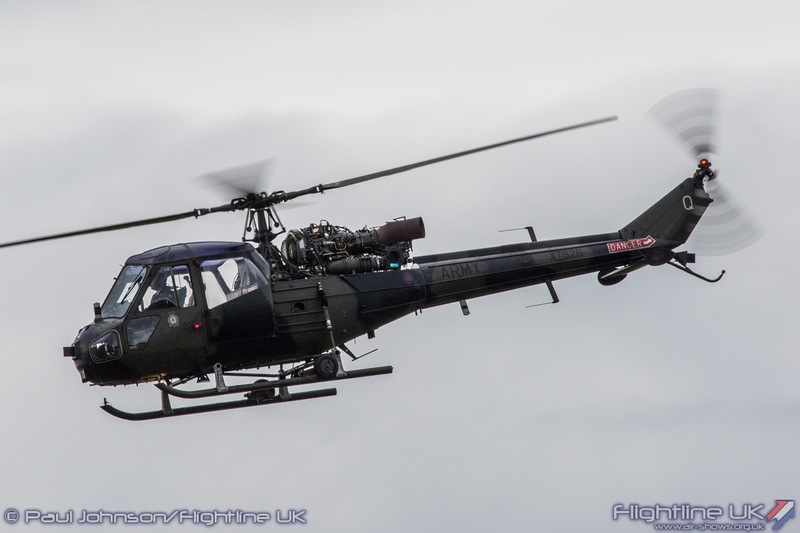 Considering all the challenges the flight has had over the winter months, it was particularly pleasing to see PS915 back in the air following further modifications on her Griffon engine. 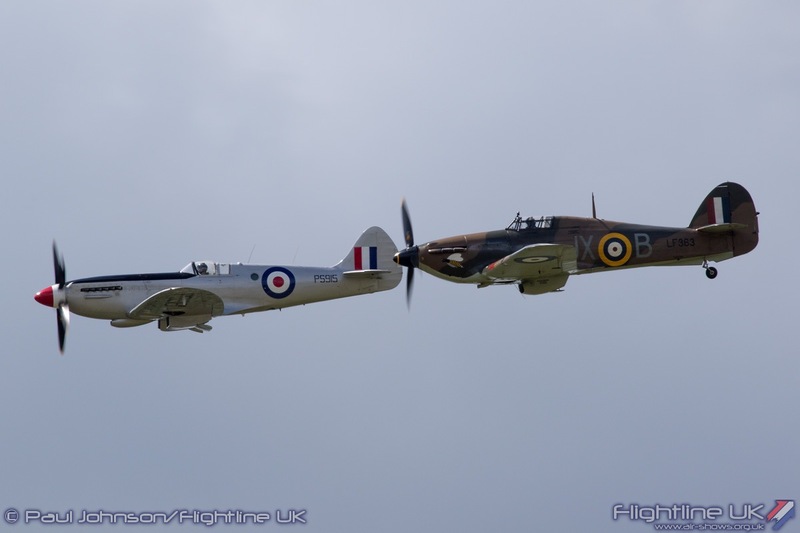 The BBMF spearheaded an interesting collection of historic aircraft in the flying. 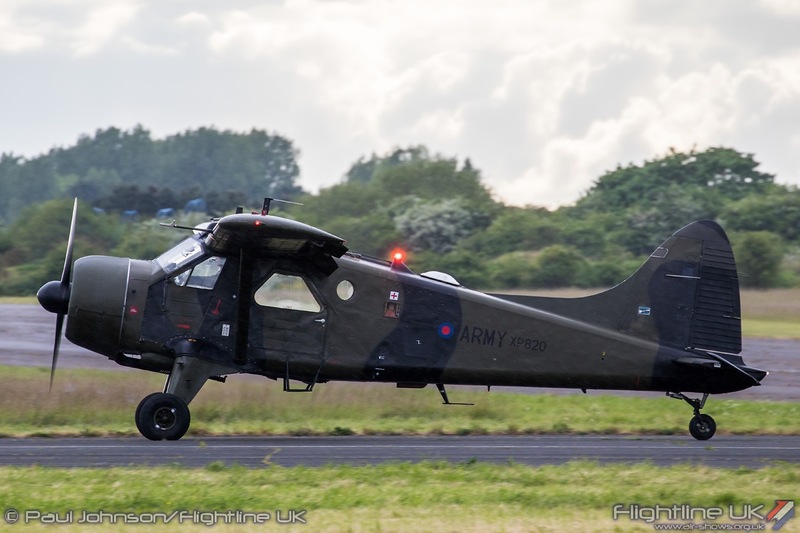 It is wonderful to see the Army Air Corps Historic Aircraft Flight back on the circuit. 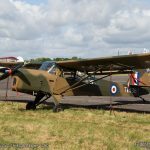 For Abingdon they brought their Westland Scout AH1 and de Havilland Canada Beaver AL1 for an interesting display mixing fixed wing and rotary flight. 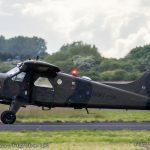 Their routine which closed the show was a role demonstration of anti-terror surveillance operations that took place in Northern Ireland with the Beaver providing intelligence information for the Scout to investigate. 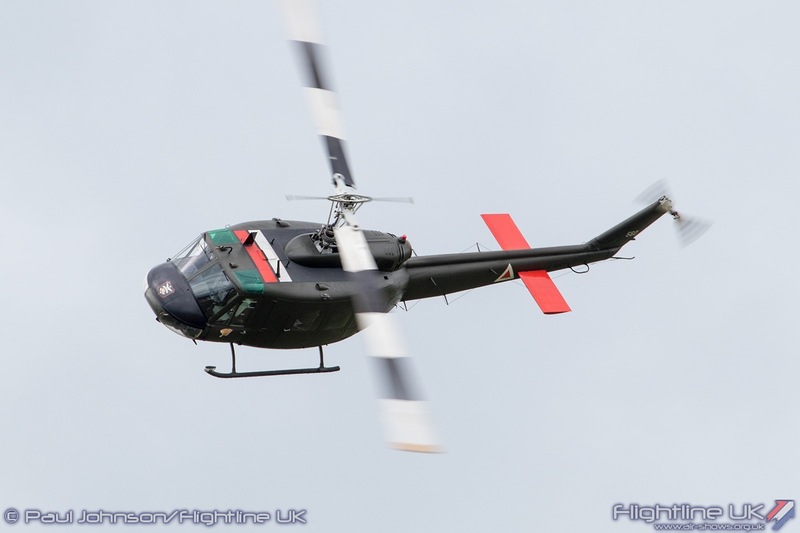 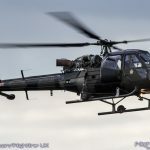 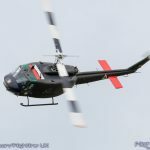 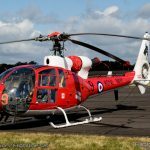 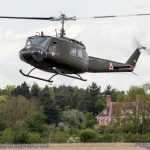 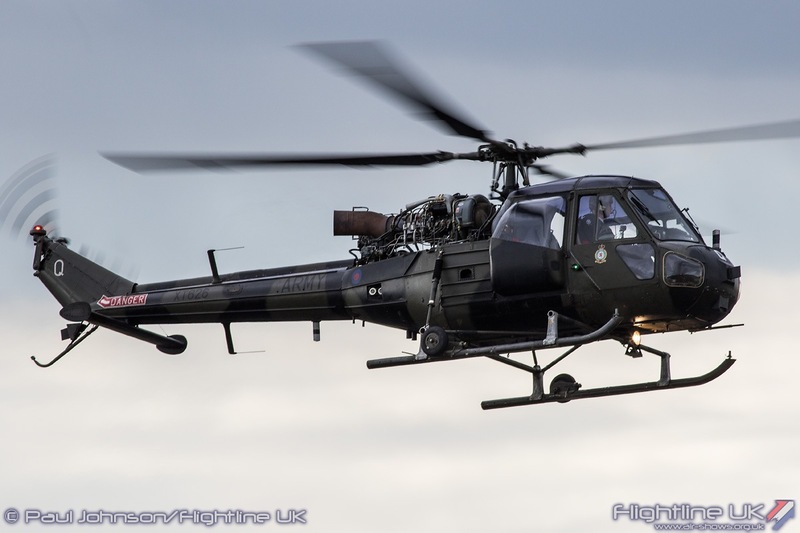 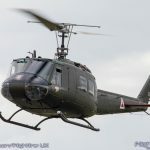 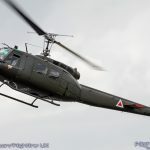 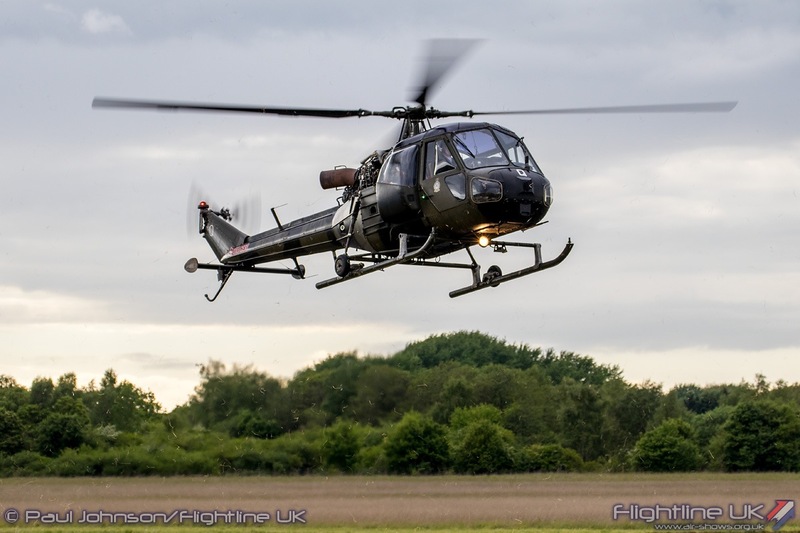 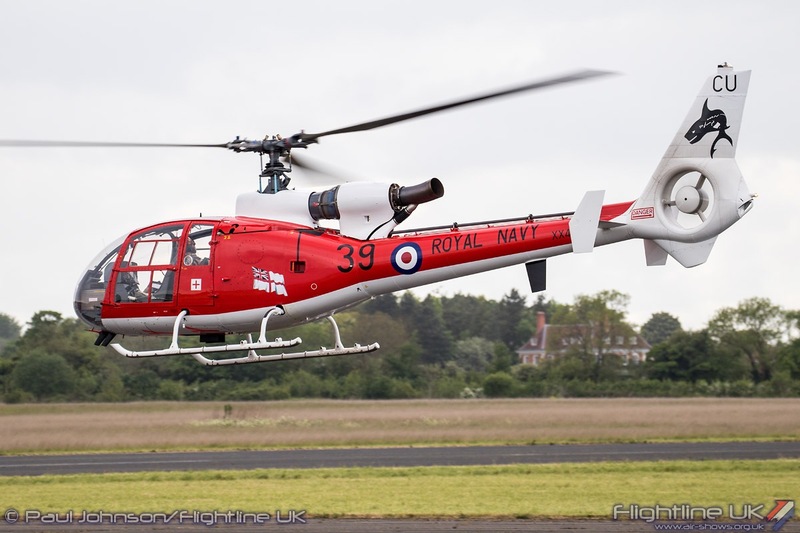 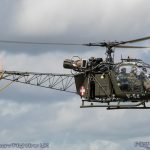 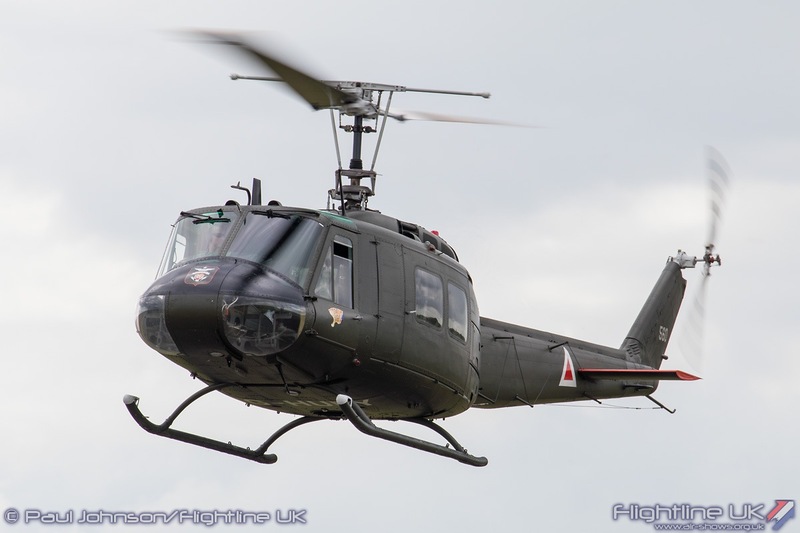 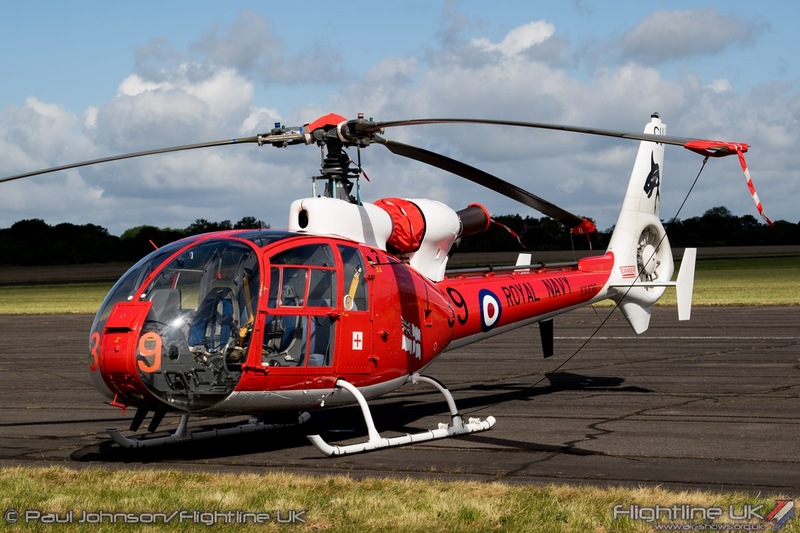 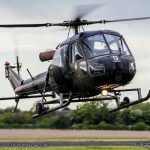 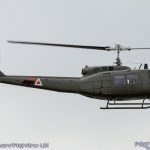 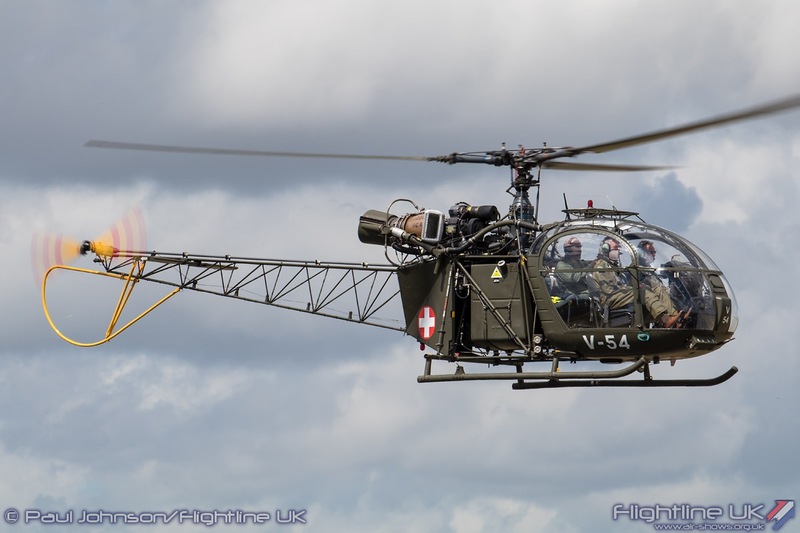 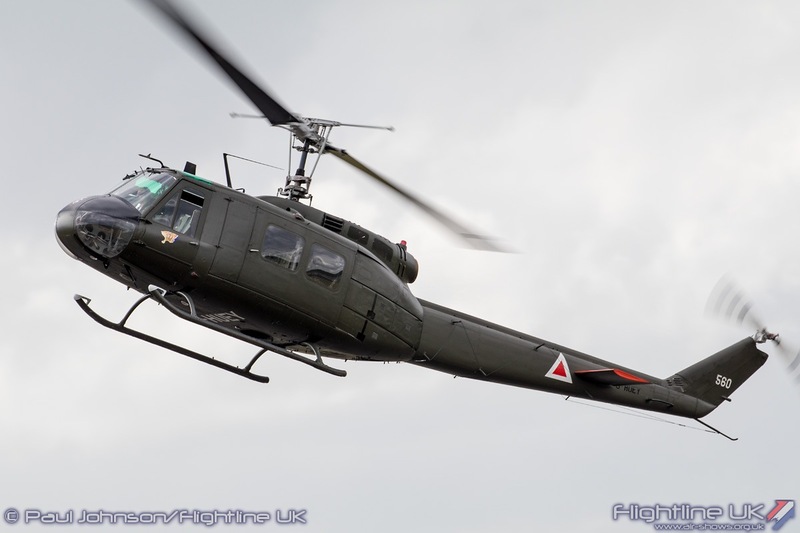 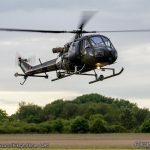 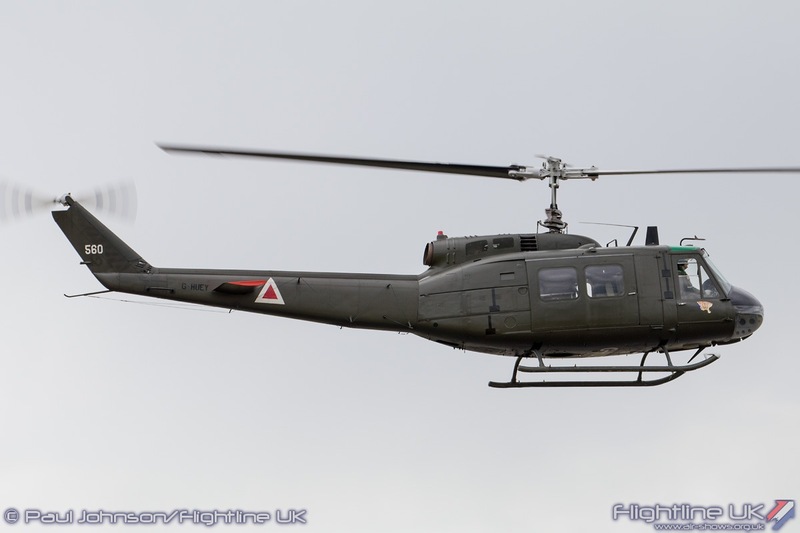 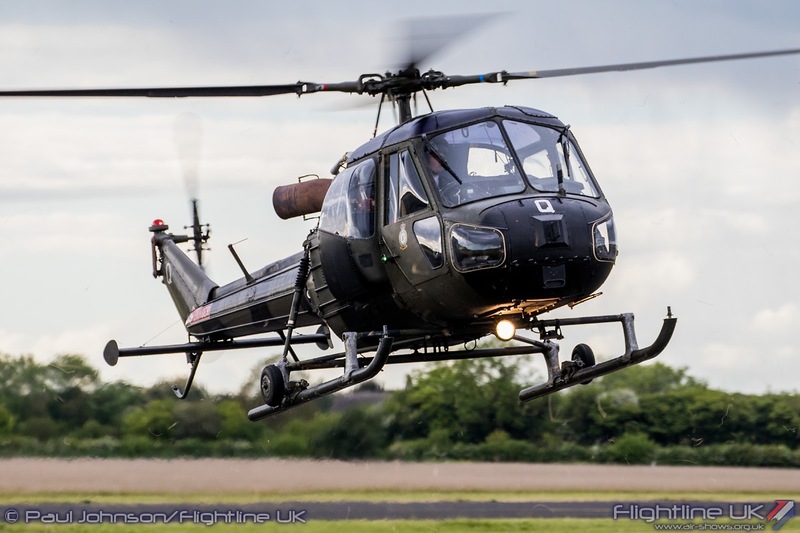 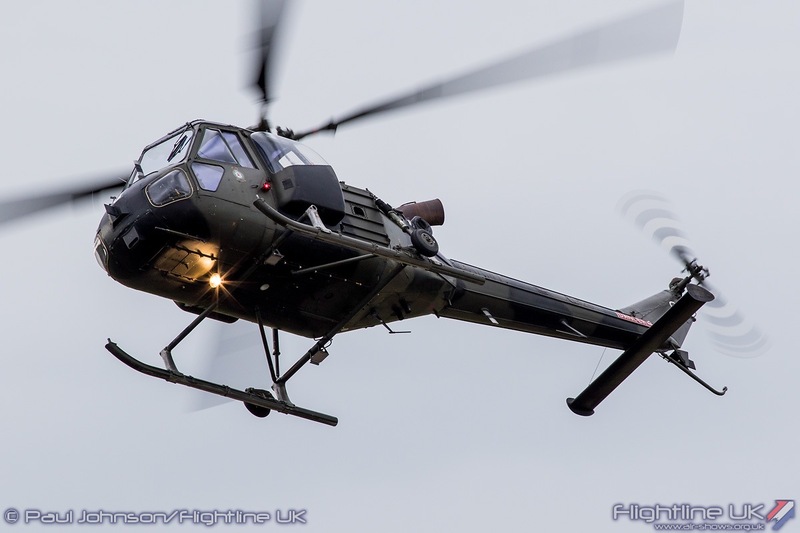 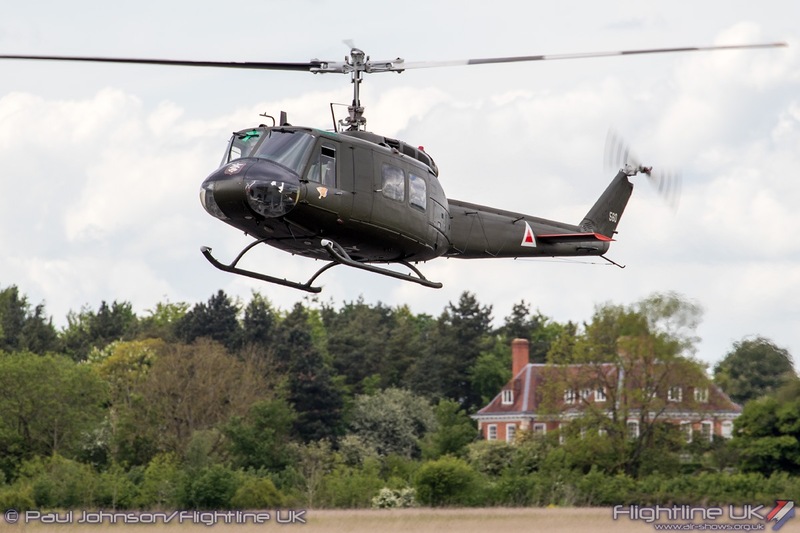 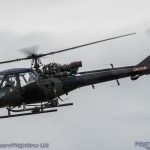 A very welcome and rare participant was the North Weald based Bell UH-1H Iroquois (or ‘Huey’) G-HUEY owned and flown by Mark Fitzgerald. 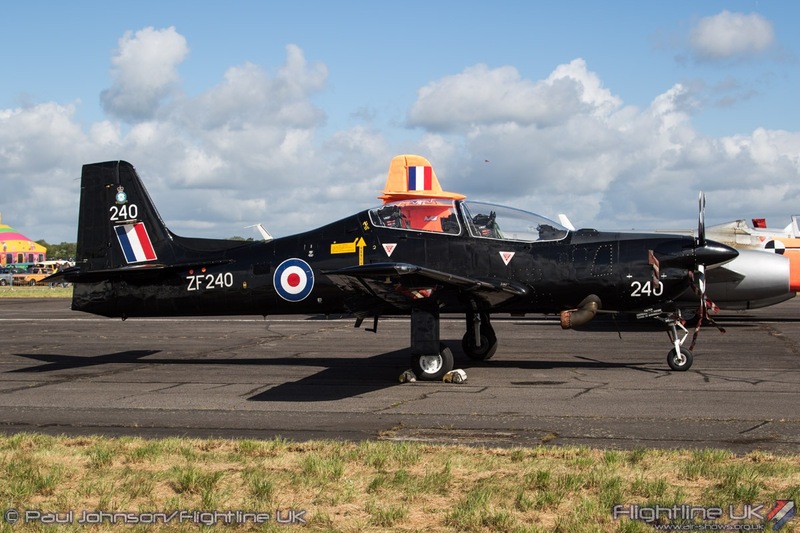 This aircraft was captured during the Falklands War and brought back to the UK. 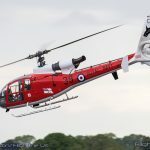 It was a regular on the airshow circuit during the 1980’s and even starred in the James Bond film ‘The Living Daylights’ as an Air Ambulance. 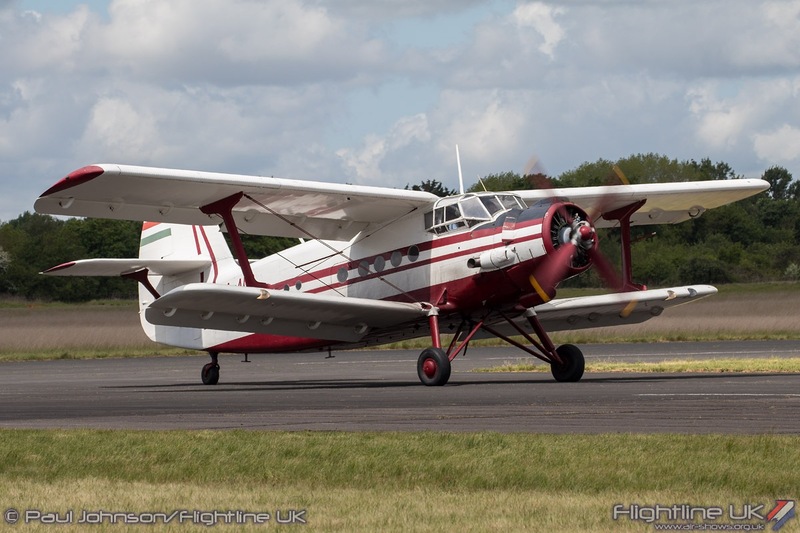 Subsequently it went to a museum before being bought by a syndicate as a restoration project. 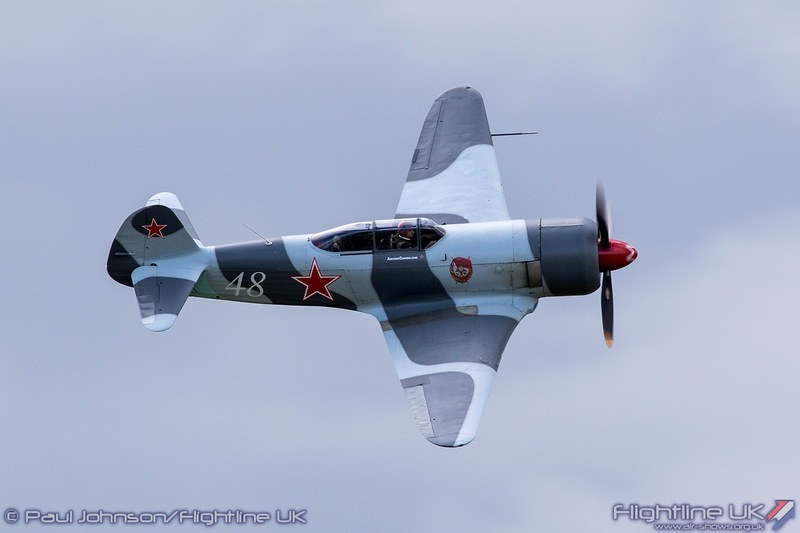 Fans of piston-powered warbirds were not left out. 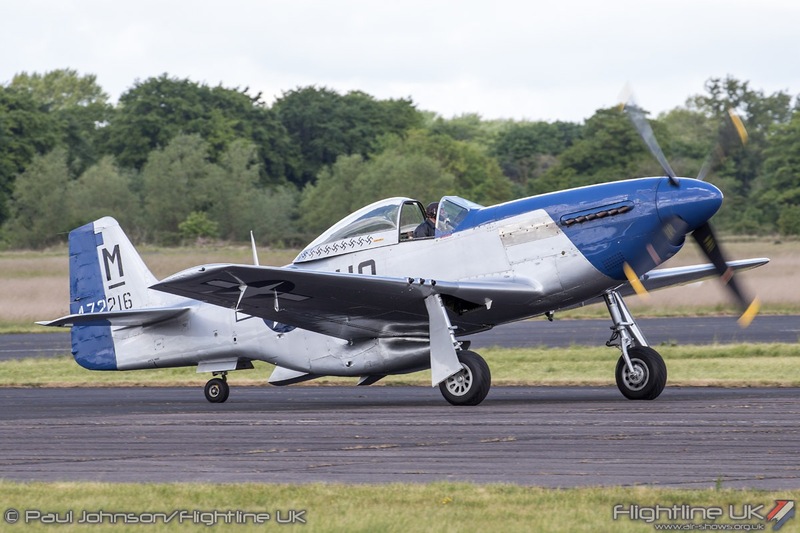 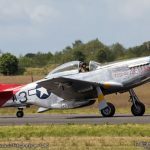 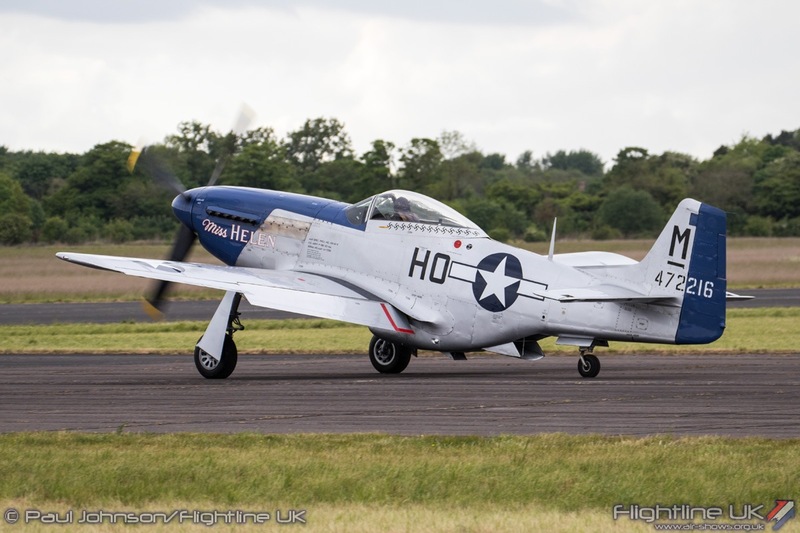 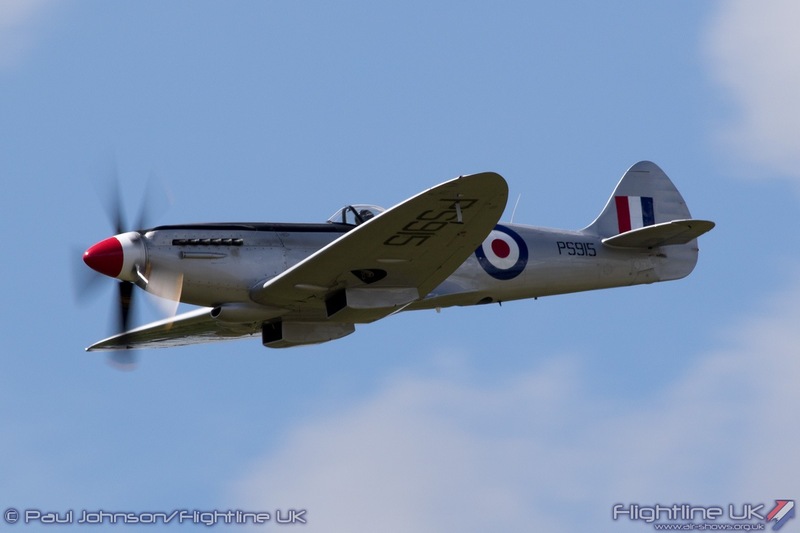 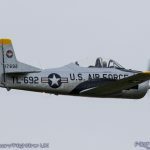 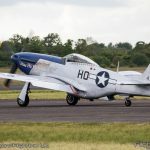 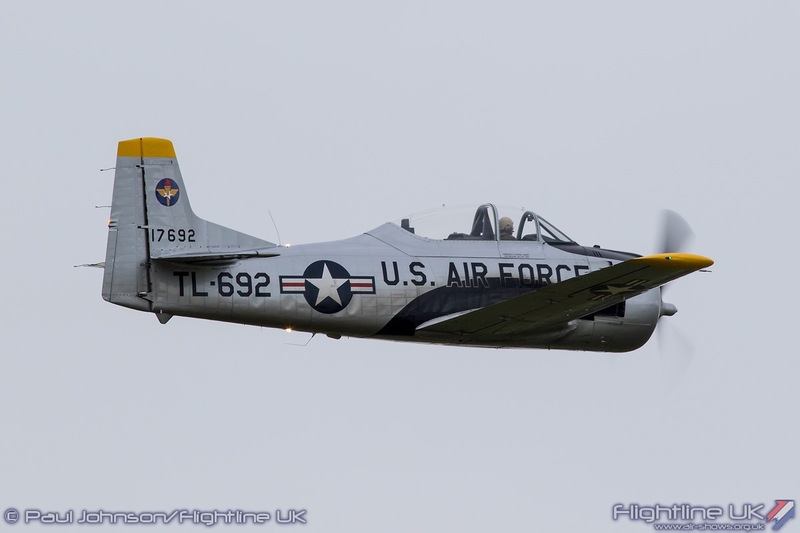 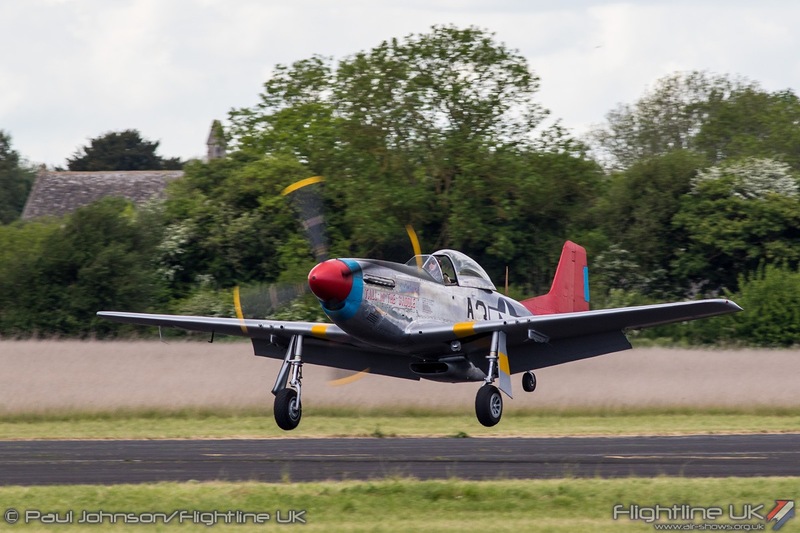 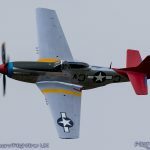 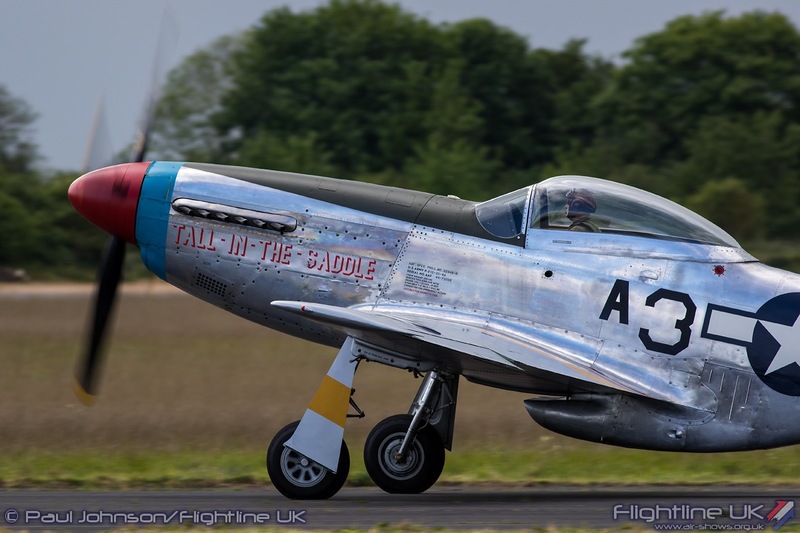 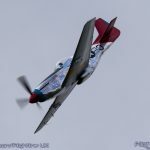 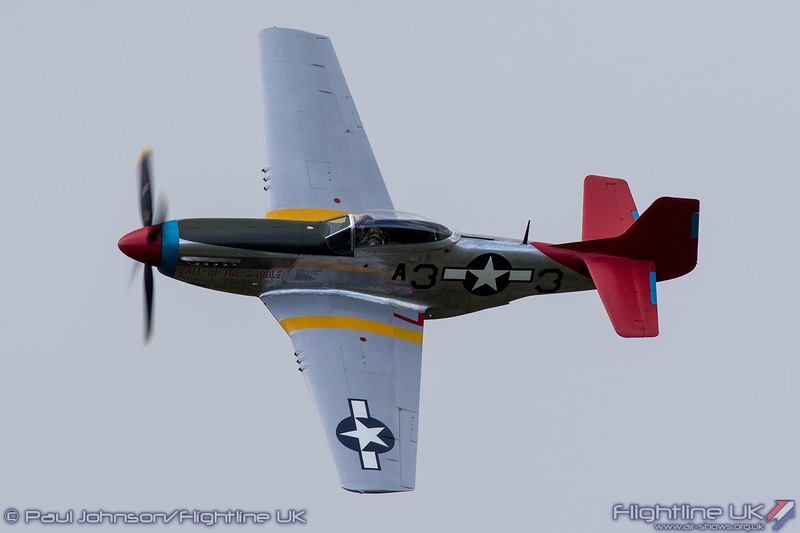 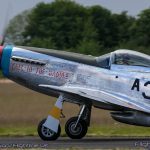 Peter Teichman returned to Abingdon with his North American P-51D Mustang “Tall in the Saddle” for an elegant routine of gentle aerobatics in the Oxfordshire skies. 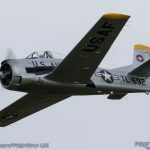 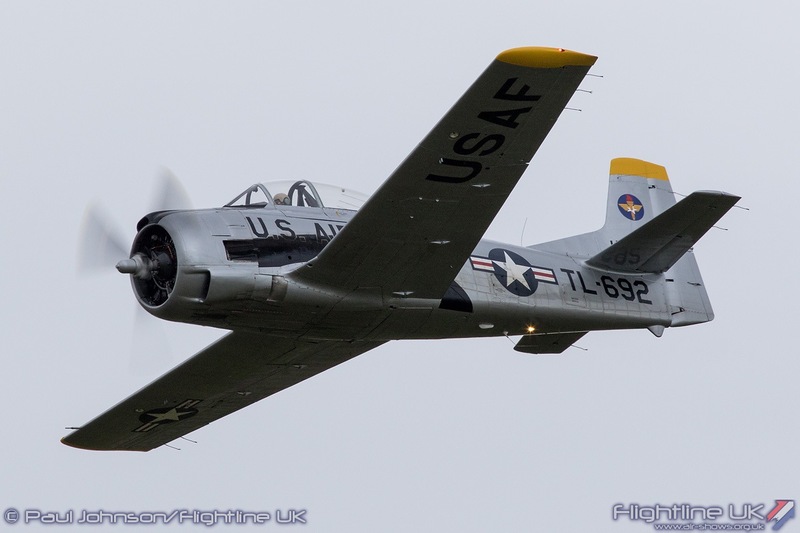 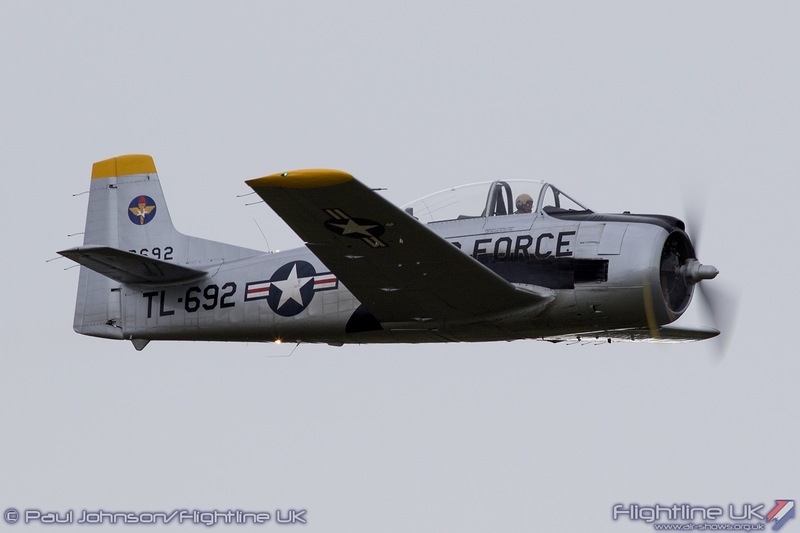 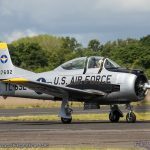 Another North American aircraft in the flying was the T-28A Trojan G-TROY flown by Ray Corstin. 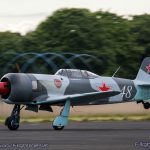 ‘OY has been a regular at Duxford displays for the past few years, albeit flying in its original French Air Force markings as a T-28S Fennec. 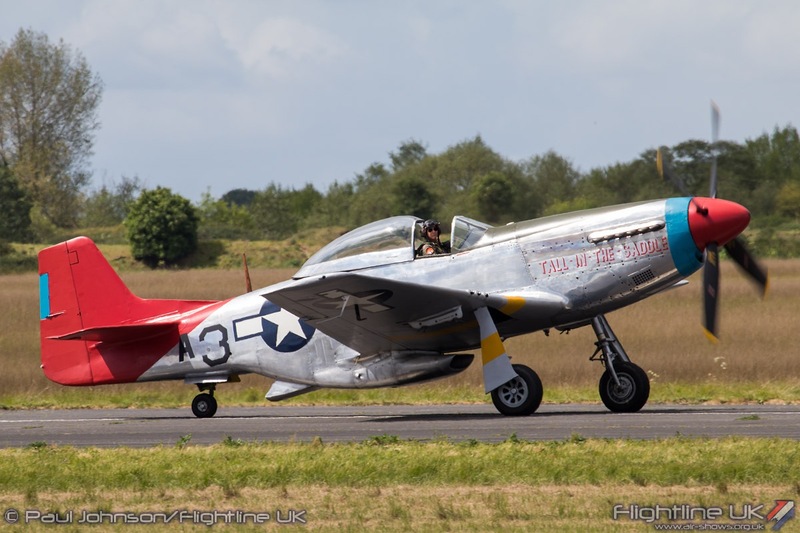 Over the winter the aircraft has been overhauled and repainted into authentic and very colourful United States Air Force markings. 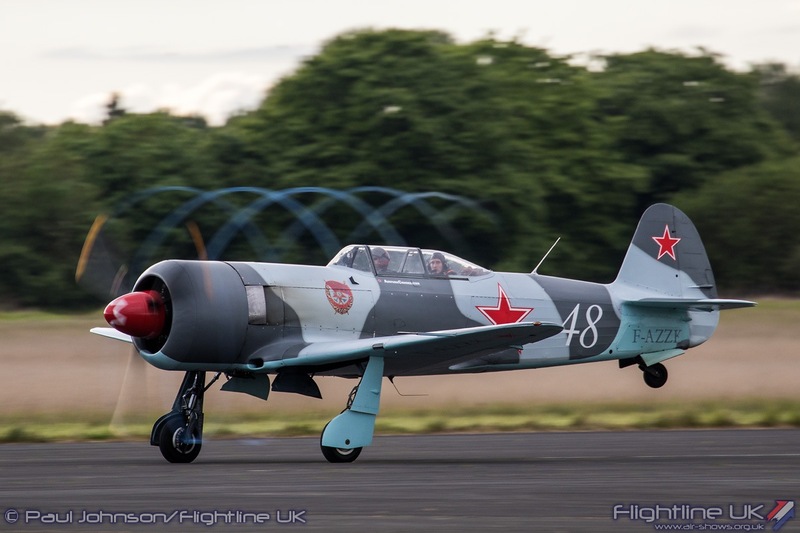 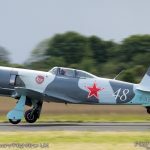 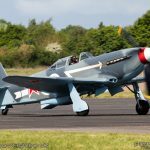 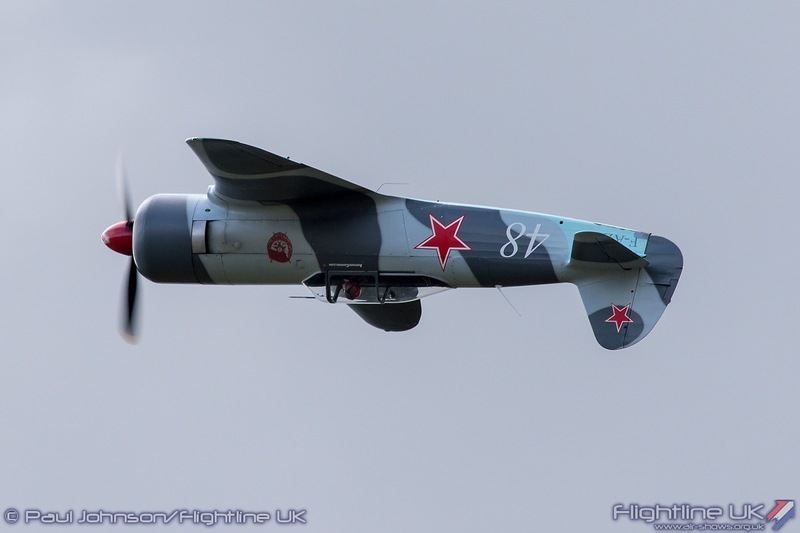 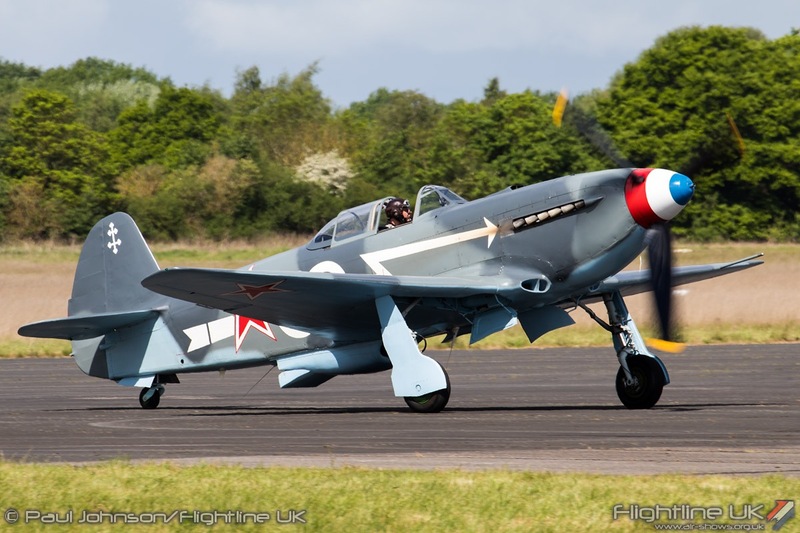 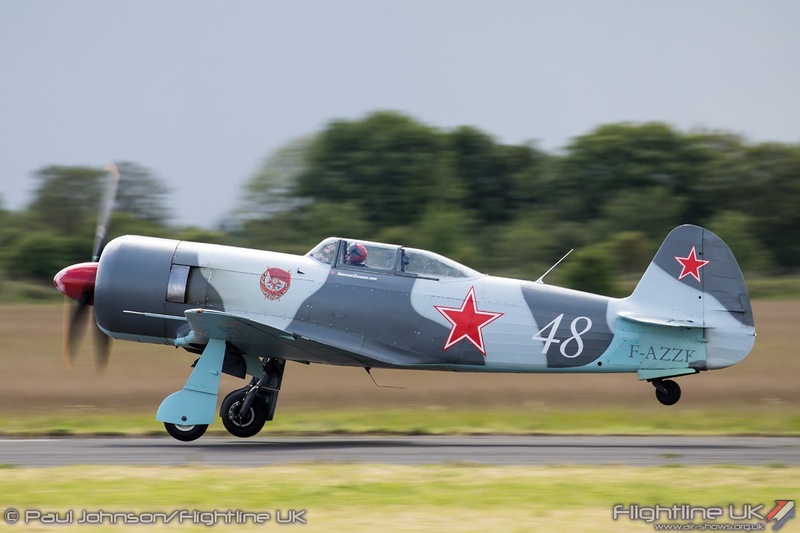 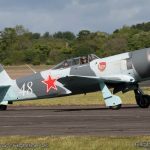 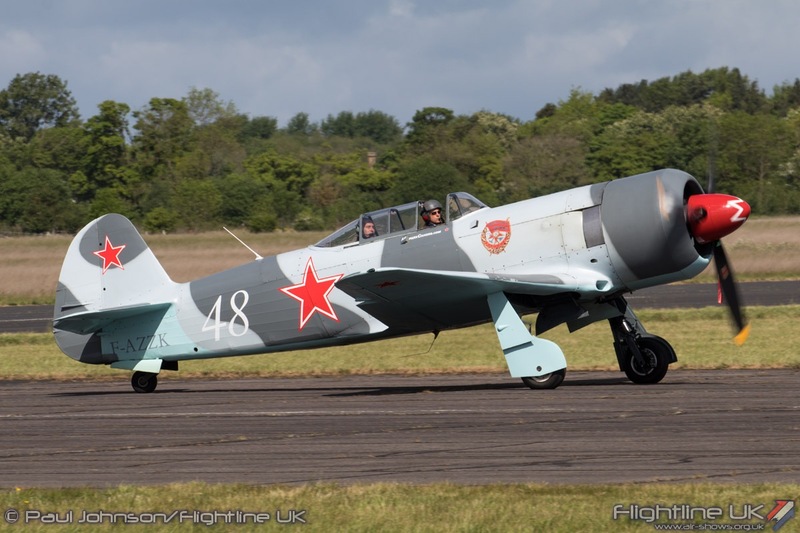 The Dutch Yak Association made its UK display debut at Abingdon with its powerful Yakovlev Yak-3U F-AZZK. 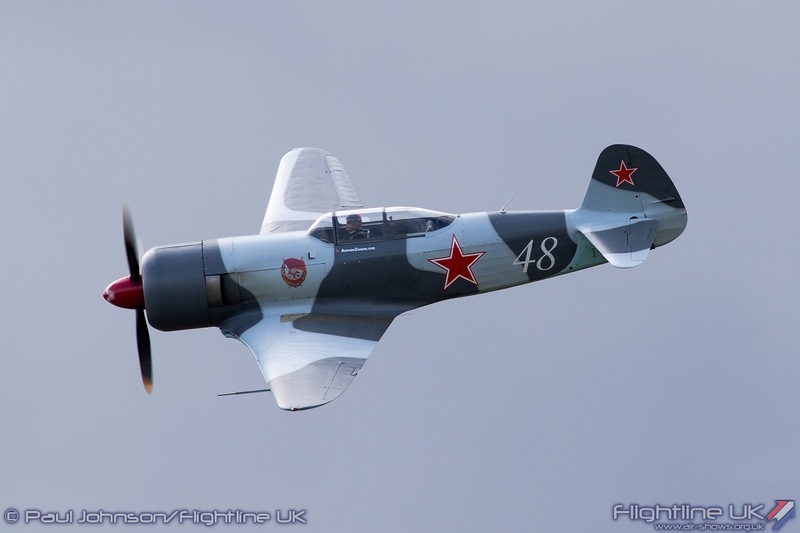 The original Yak-3U was a post war development of the Yak-3 which a Shvetsov radial engine. 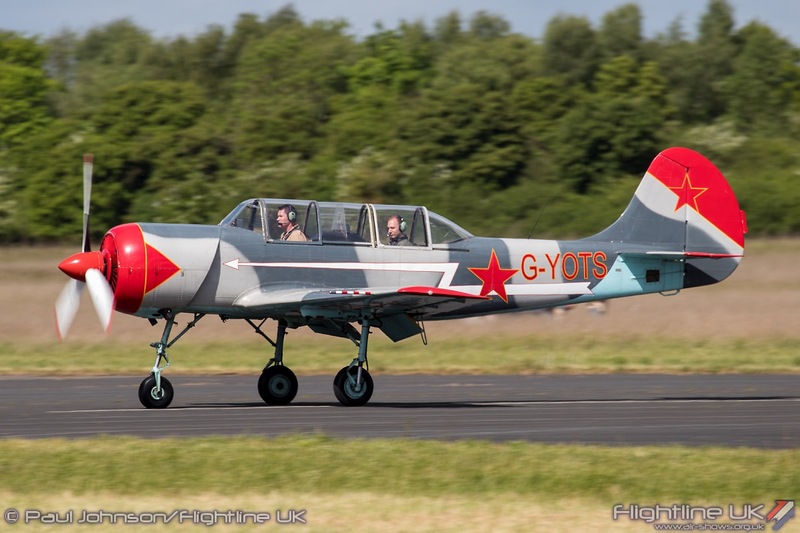 The Yak Association’s aircraft is a reproduction aircraft derived from the Yak-11 trainer. 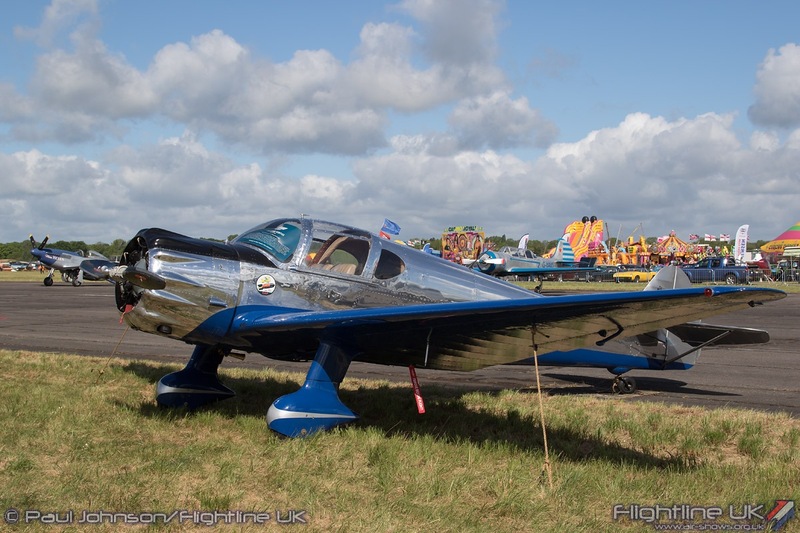 The project was started in the US, but imported into Europe in 2005. 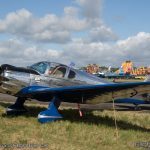 It is powered by an American Pratt & Whitney R1830 radial engine rather at 1200hp. 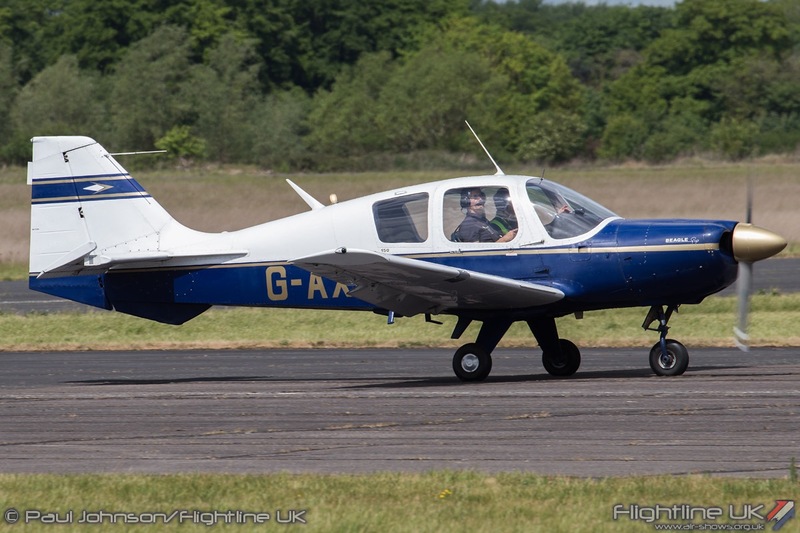 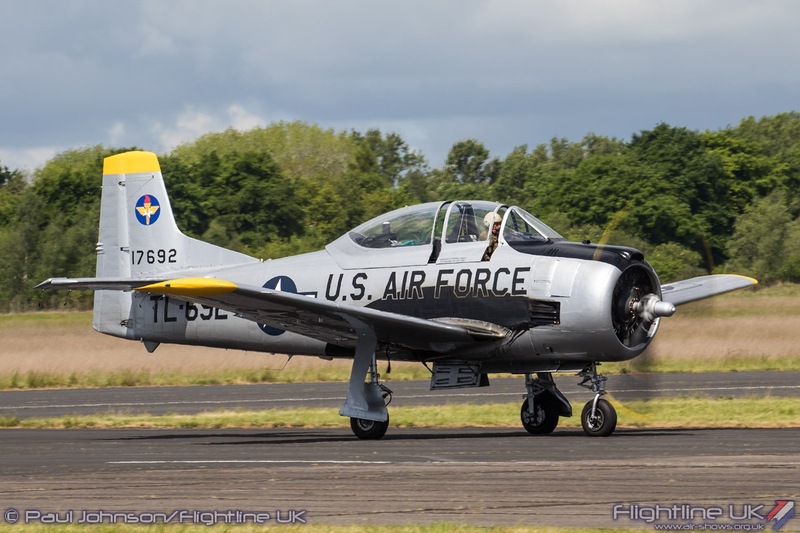 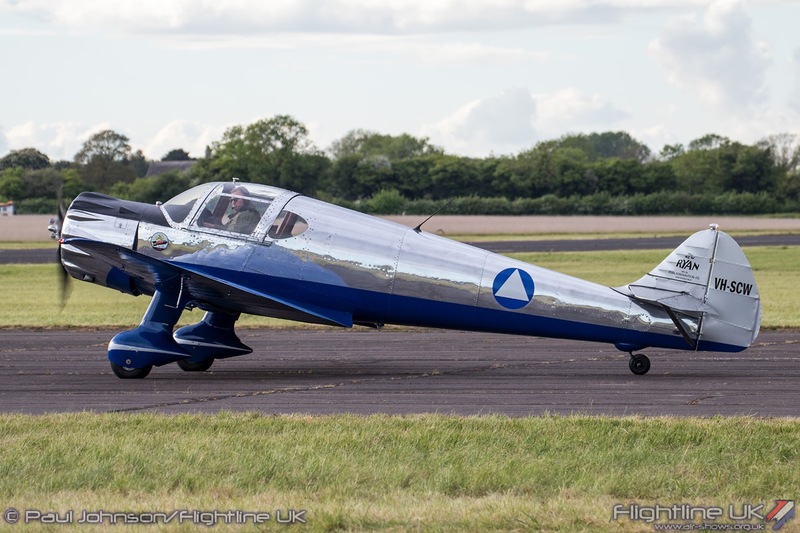 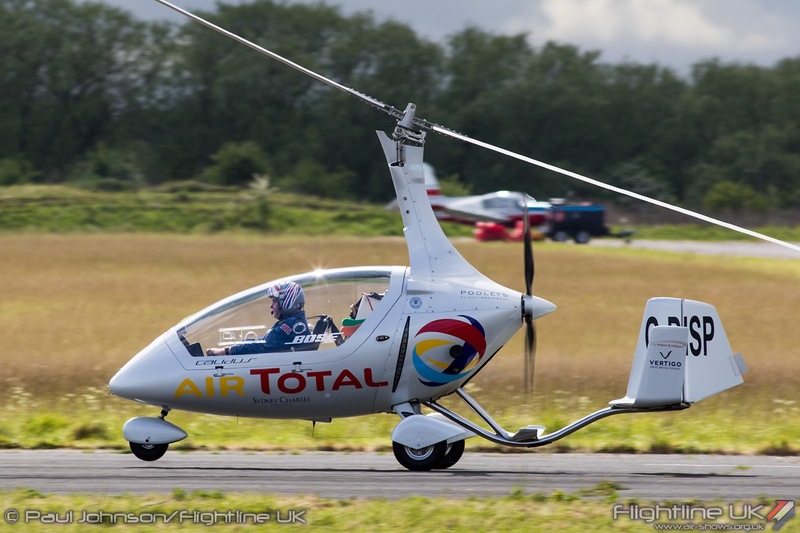 This gives the aircraft incredible performance as pilot Rick van de Graaf demonstrated over Abingdon with a very impressive battle climb after take-off and using all the available airspace! 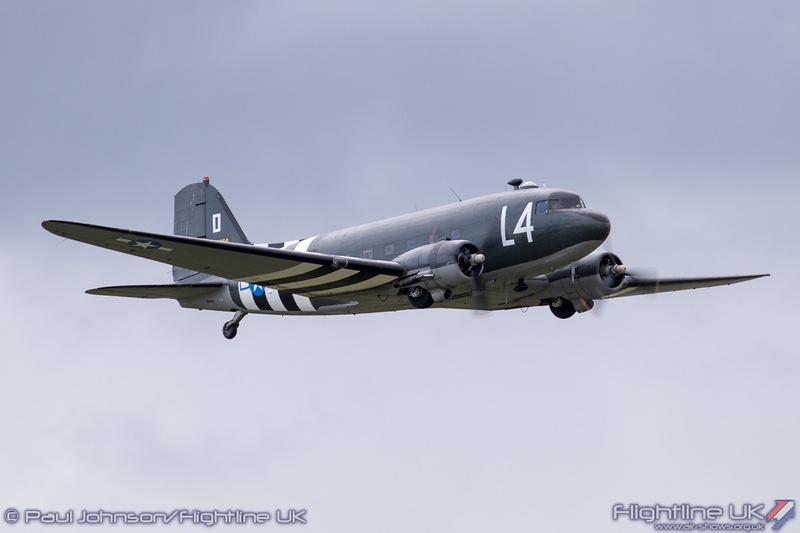 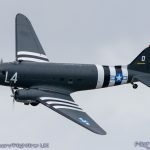 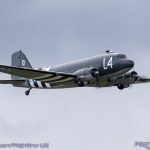 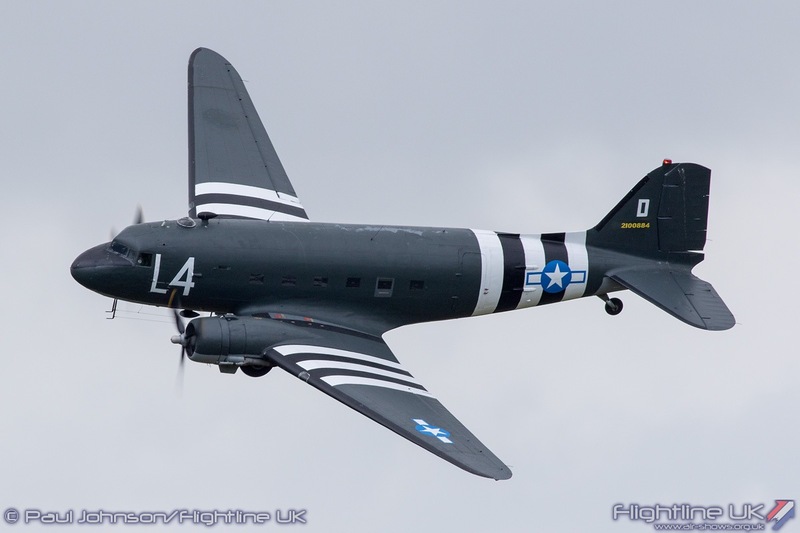 The World War Two ‘heavies’ were represented by Aces High’s Douglas C-47A Skytrain flown by Andrew Dixon and Pete Kynsey. 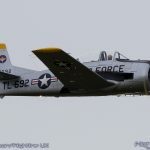 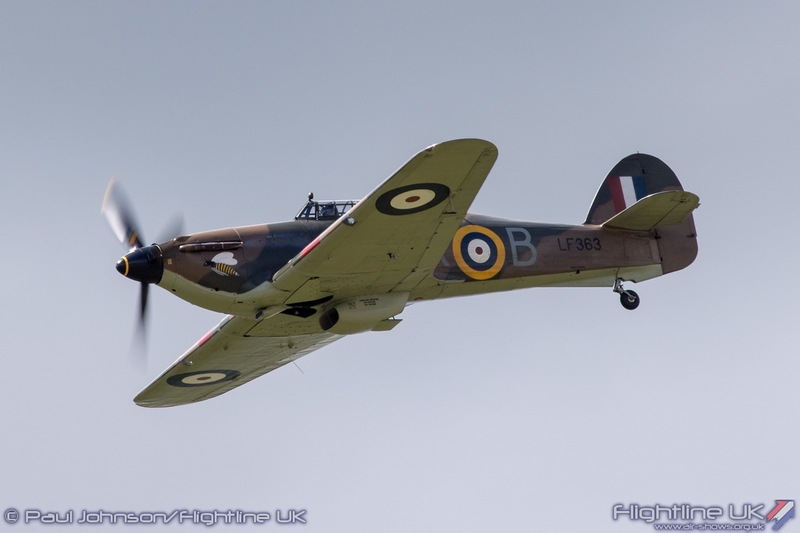 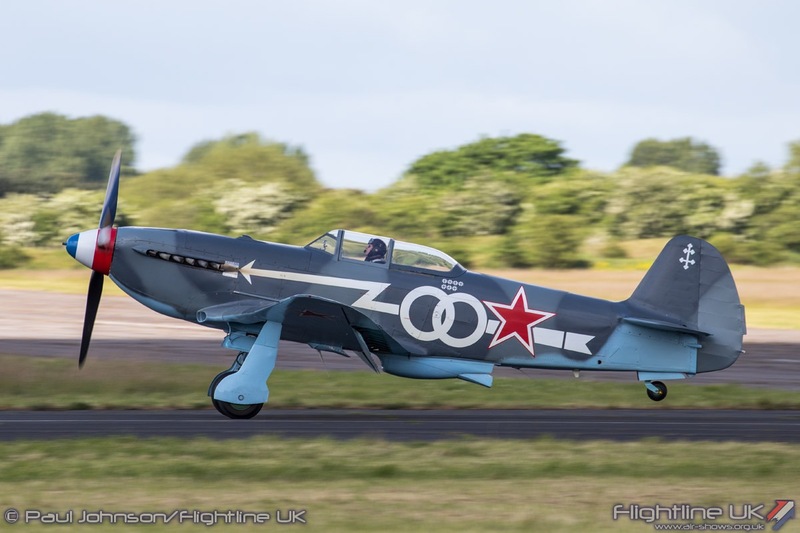 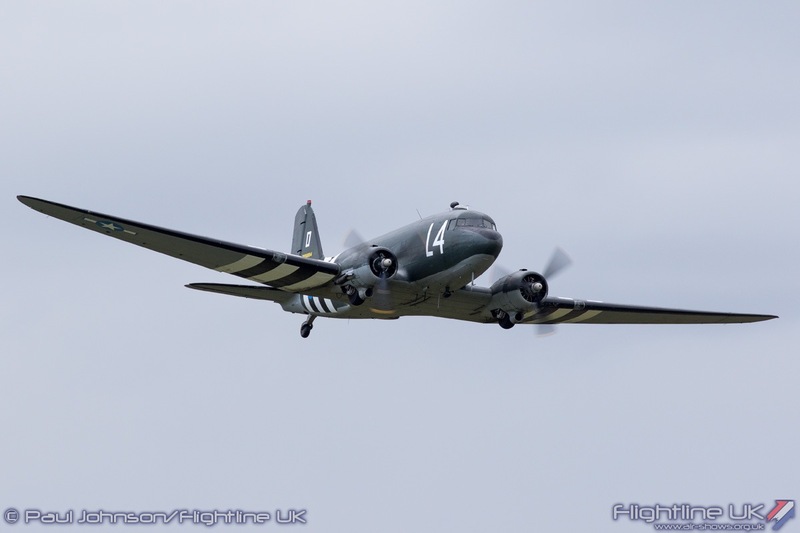 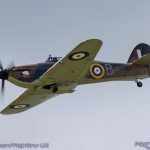 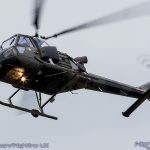 The aircraft is a regular on the display circuit and filming and has recently been seen operating off a beach in North Devon as part of a forthcoming production. 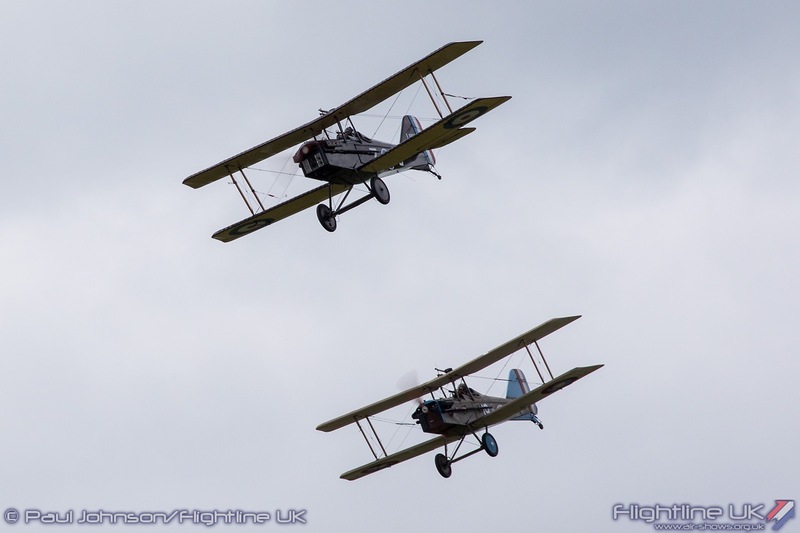 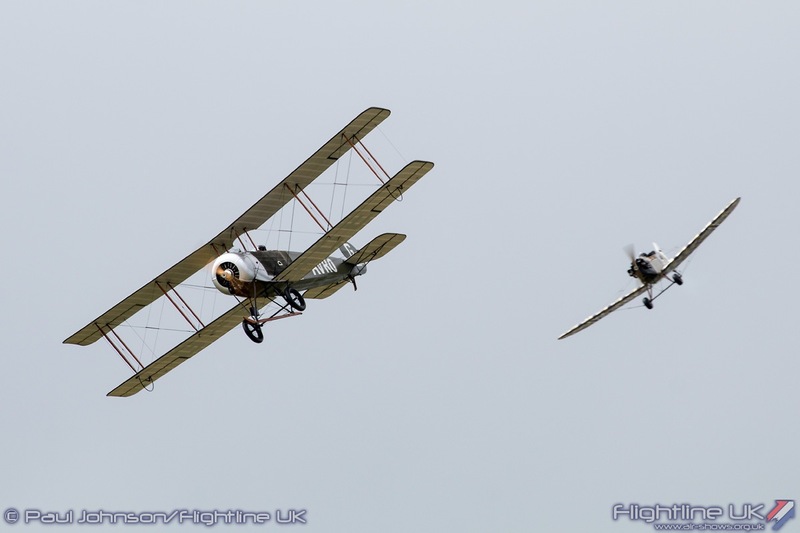 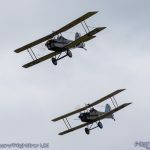 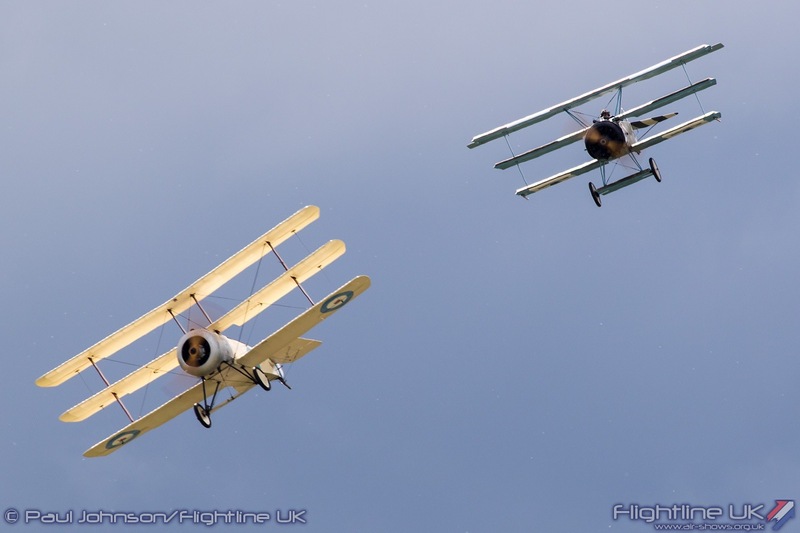 The Great War Display Team made their Abingdon debut this year filling the skies with aircraft and recreating the swirling dogfights of the First World War. 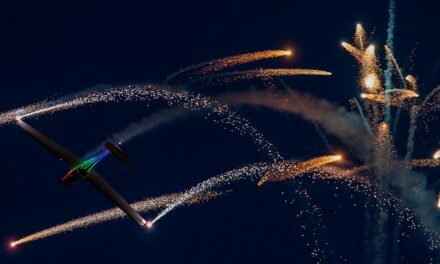 Their display was supported by some impressive ground based pyrotechnics to add to the unique atmosphere of their display. 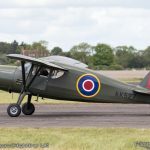 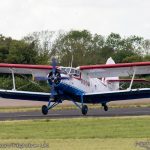 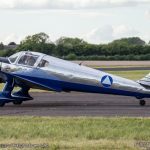 Notable for Abingdon was the display debut of Matthew Boddington’s Avro 504K replica ‘Olivia.’ Unfortunately, pilot Dan Griffiths detected an issue during the display and made a precautionary landing in the long grass on the far side of the airfield. 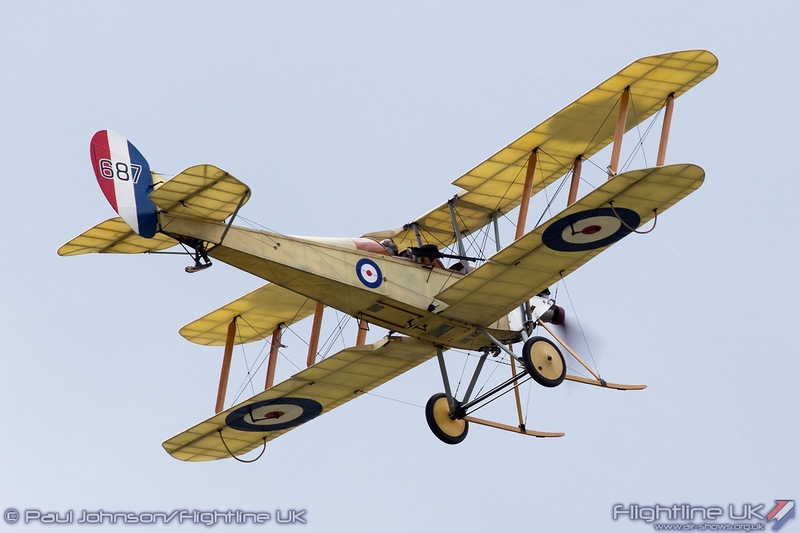 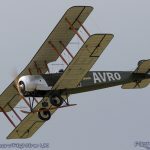 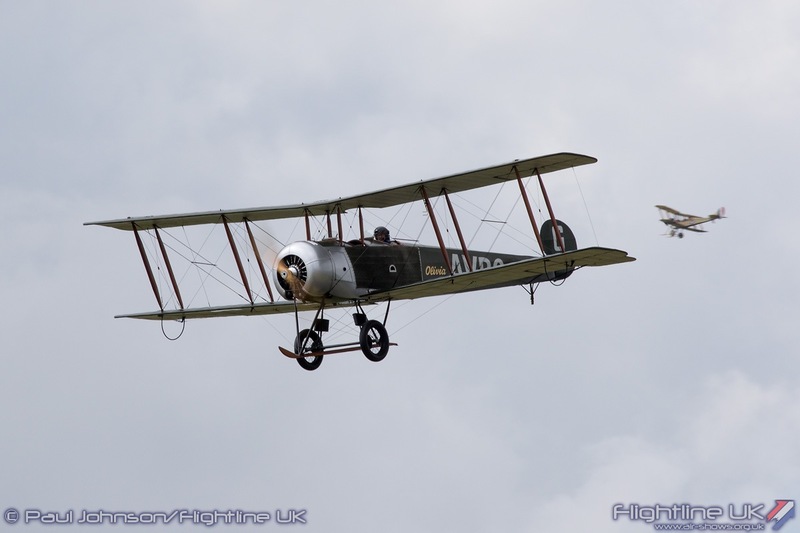 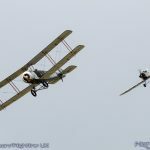 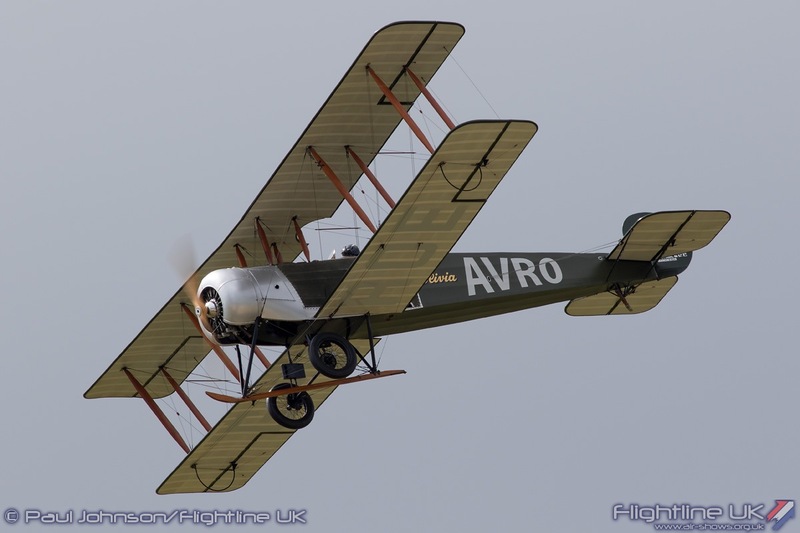 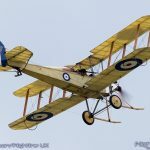 Flying with the Avro were replicas of the RAF BE2c, two RAF SE5a, the Sopwith Triplane, a Fokker Dr1 and two Junkers CL1. 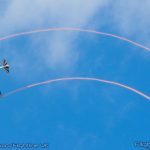 The historic military displays were interspersed with some civilian teams. 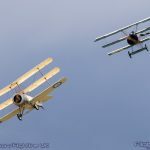 Sadly due to the interruption to the display flying we did lose displays from Peter Davies in the Rotorsport Calidus (though he was seen arriving and departing for home) and a solo display from the Breitling Wingwalkers. 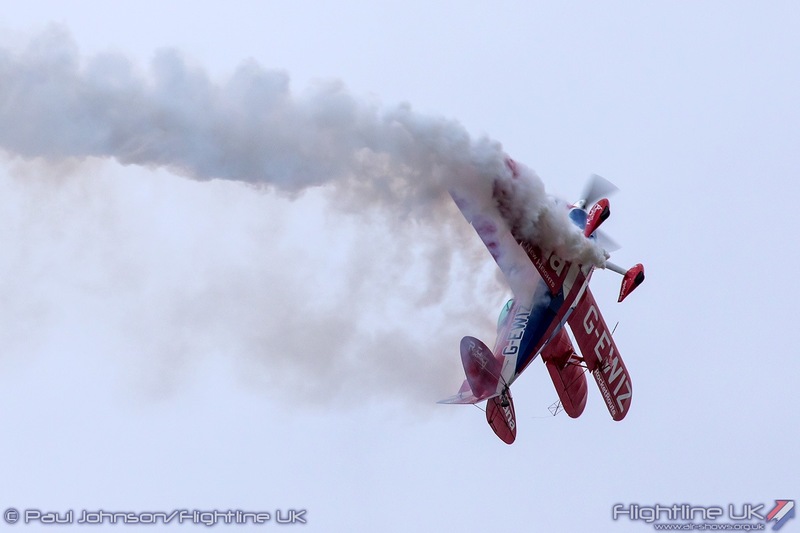 However, alongside the Twister Aerobatics Team, there were some other top civilian displays. 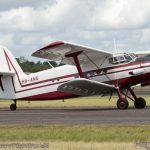 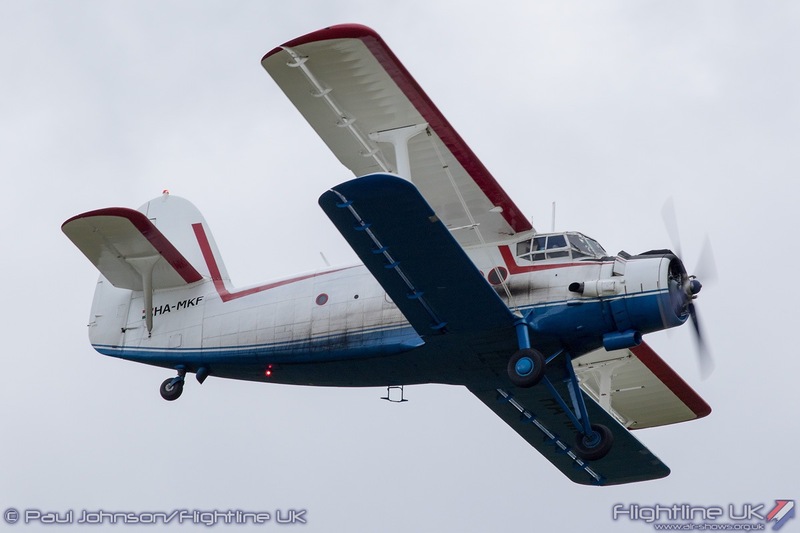 It was good to see the Popham based Antonov An-2 back after missing a few display seasons. 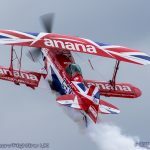 ‘The Mighty Annie’ is an aircraft that certainly does lack presence at an airshow and is always an impressive performer. 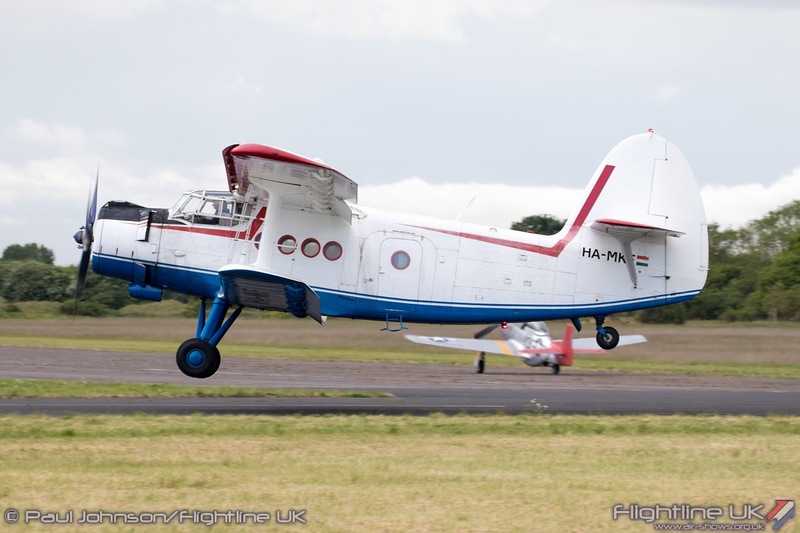 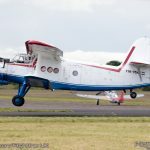 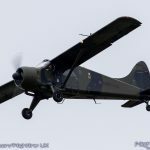 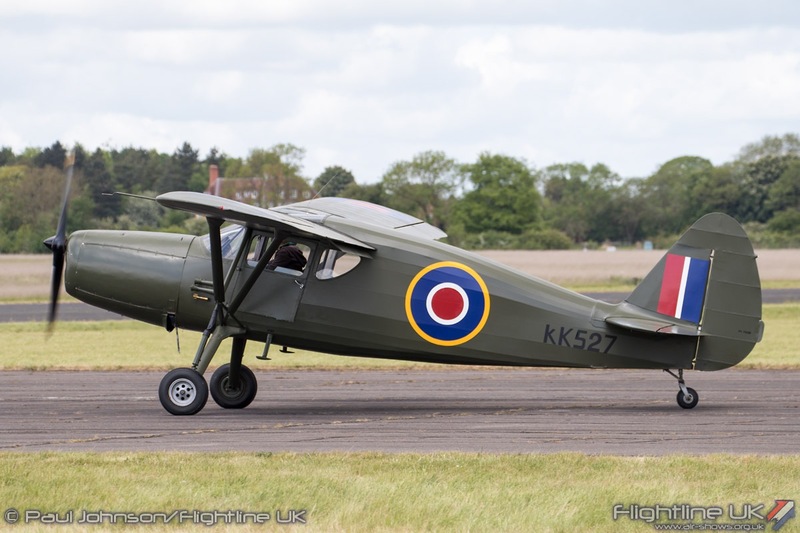 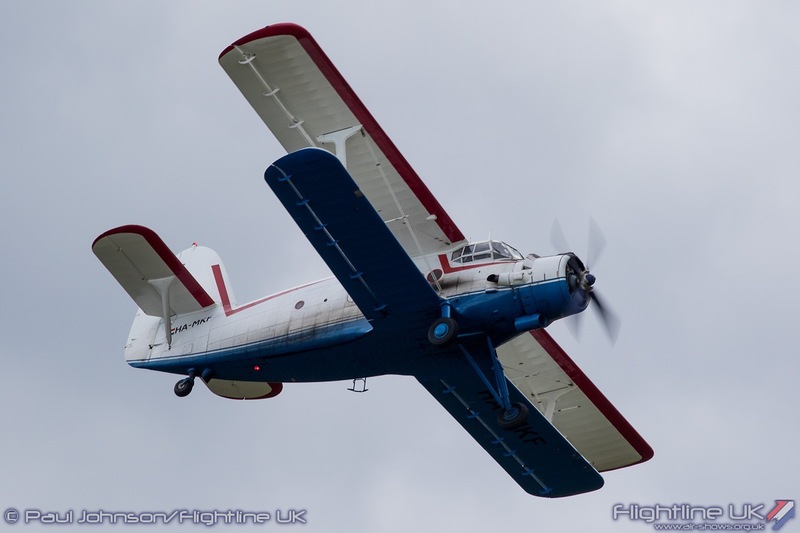 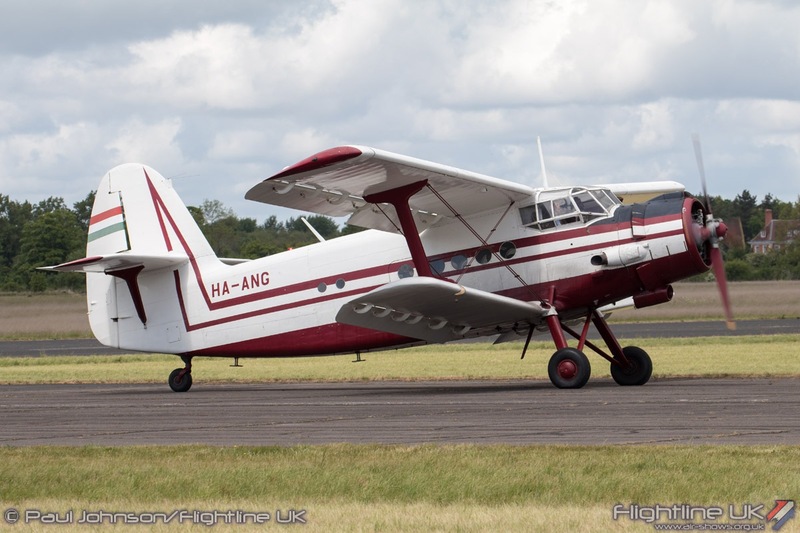 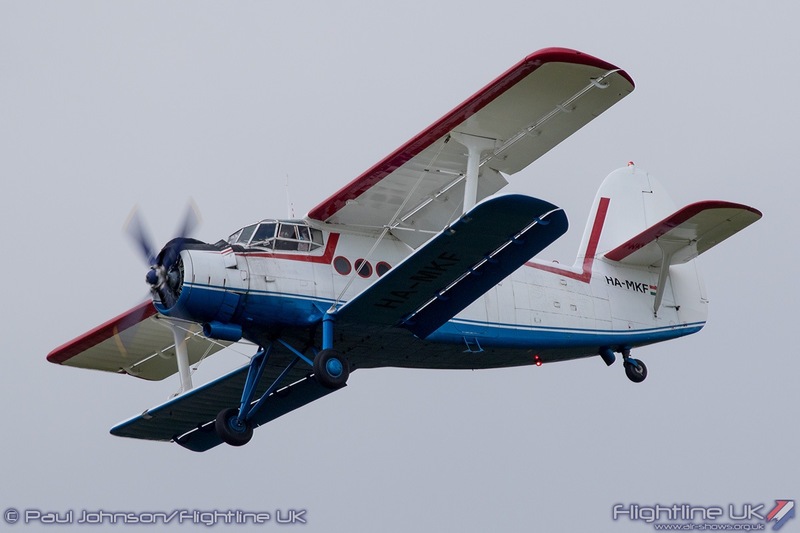 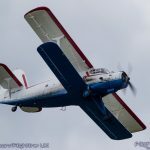 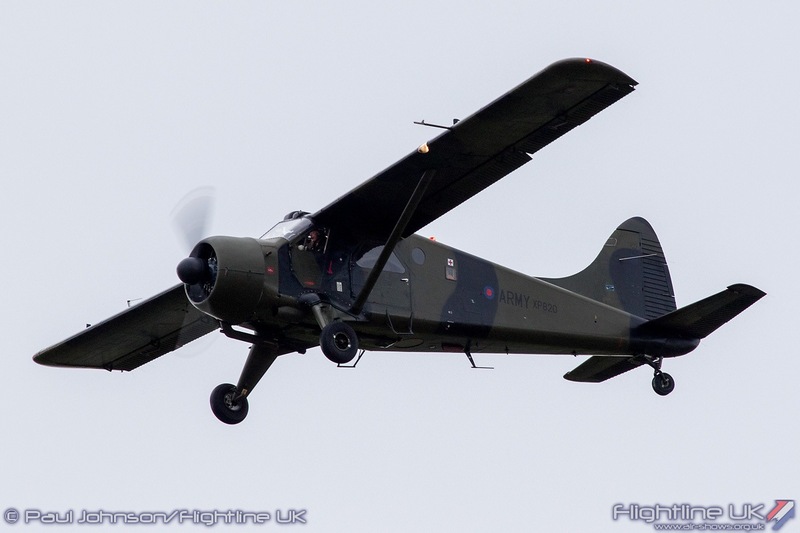 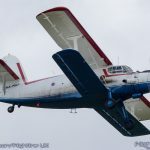 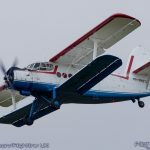 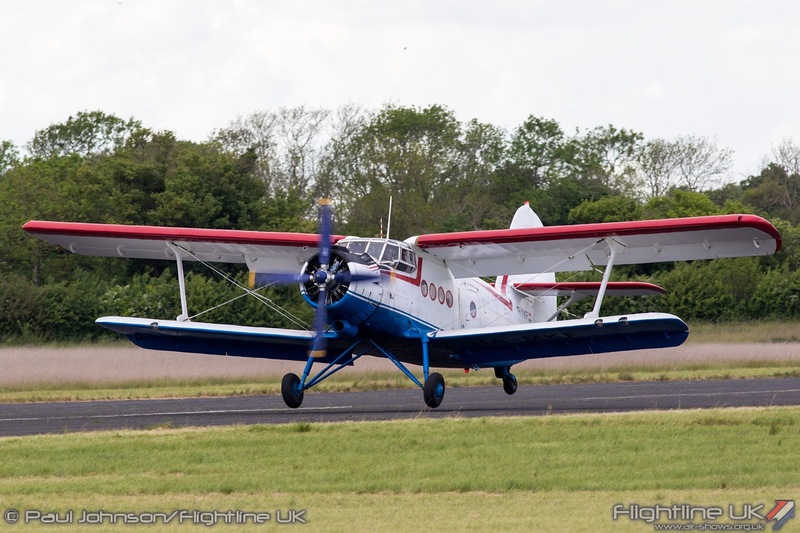 A further An-2 also acted as the jump-ship for the Jump4Heroes Parachute Team who just managed to beat the worst of the weather for their display. 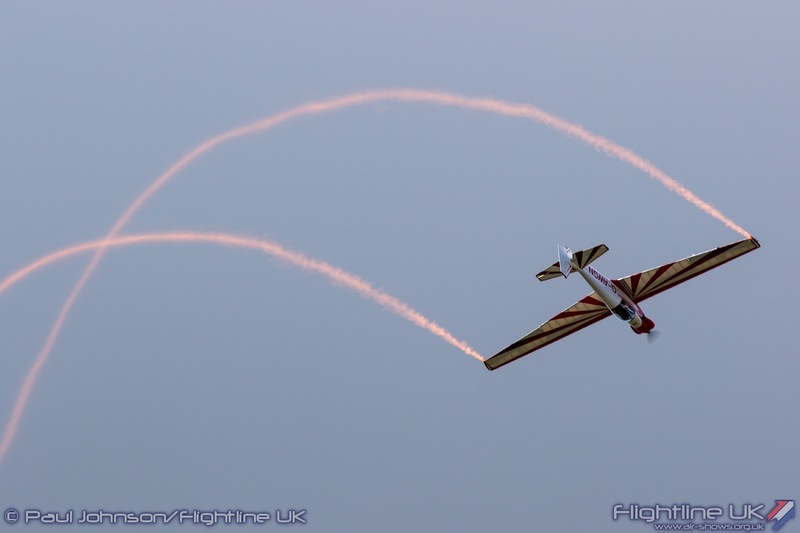 Lauren Richardson gave her first display in the Fournier RF4D owned by Bob Grimstead. 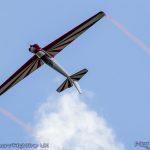 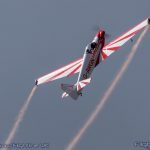 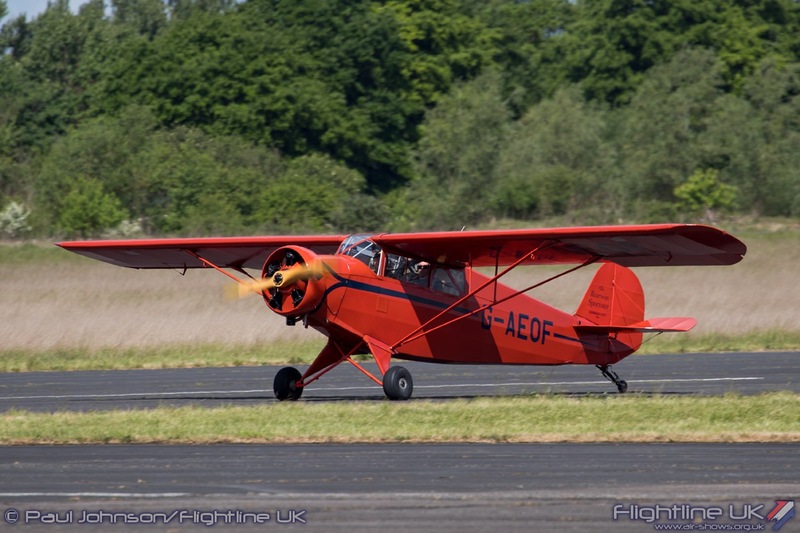 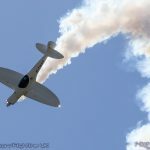 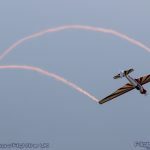 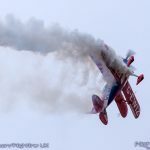 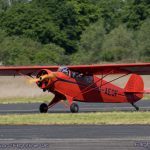 The Fournier is completely different from her own Pitts Special, but Lauren gave a very spirited routine of gentle loops and rolls drawing delicate lines of orange smoke in the sky. 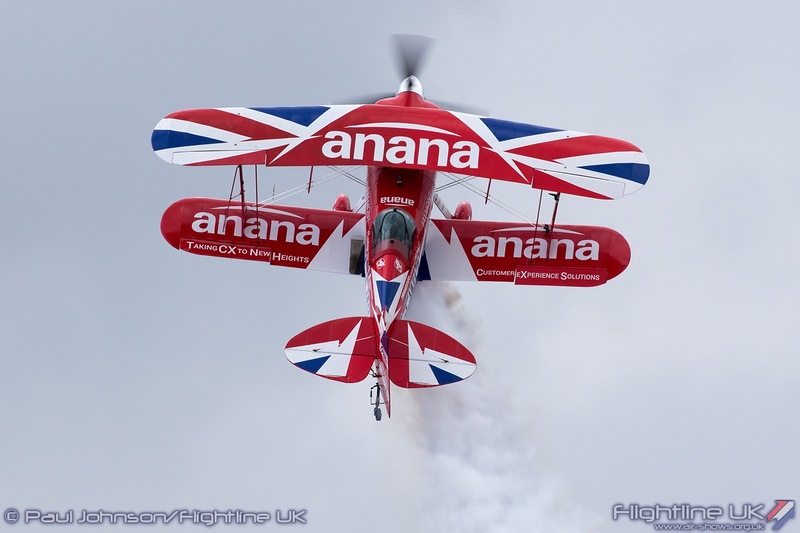 At the other end of the scale came the Anana-sponsored Pitts S-2S Special, the ‘Muscle Biplane,’ flown by Rich Goodwin. 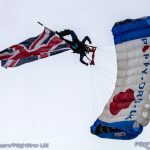 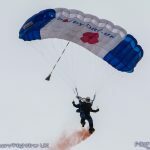 Despite some rather dark clouds blowing in just as he took off, Rich simply wowed the crowd with his routine of gyroscopic tumbles, near hovers and crisp aerobatics! 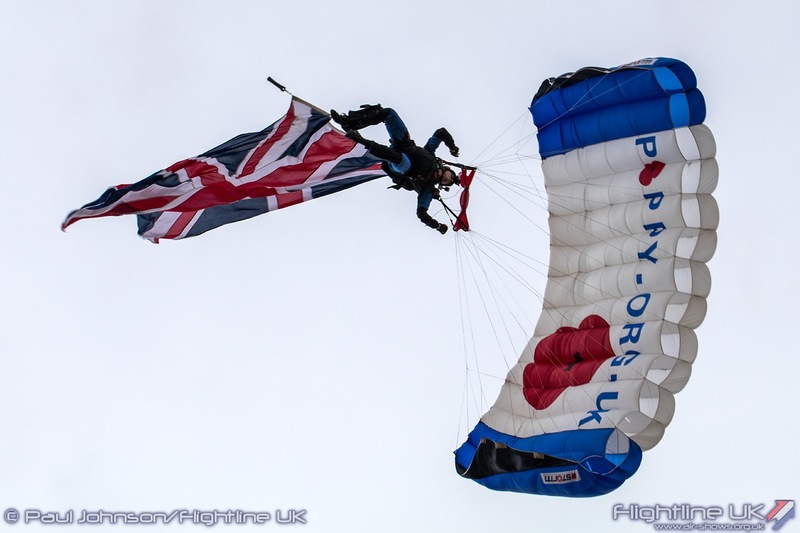 It was a difficult day for the Abingdon organisers, volunteers and participants. 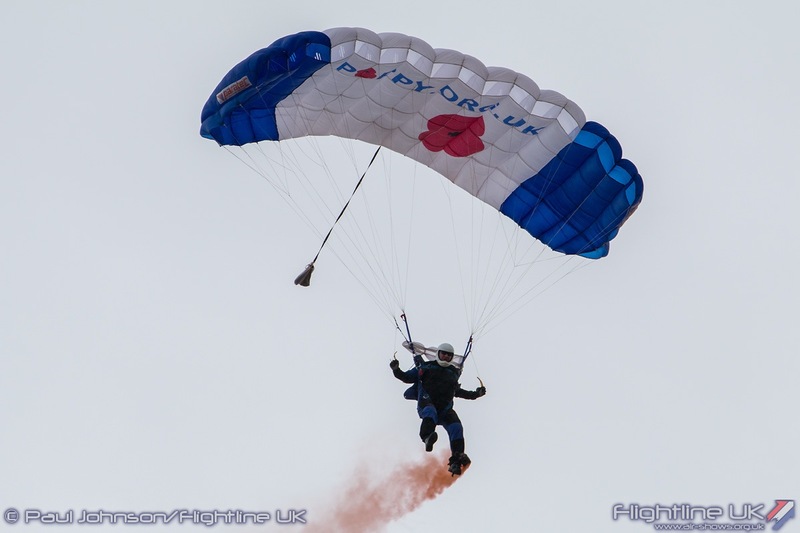 The new layout clearly caused a few issues and we are sure the organisers will overcome these for future events. 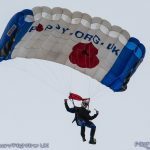 However, despite everything all that helped put on this event should be proud of what they achieved given what they dealt with on the day. 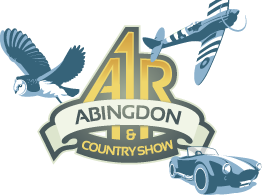 We certainly look forward to being back at Abingdon in 2018.